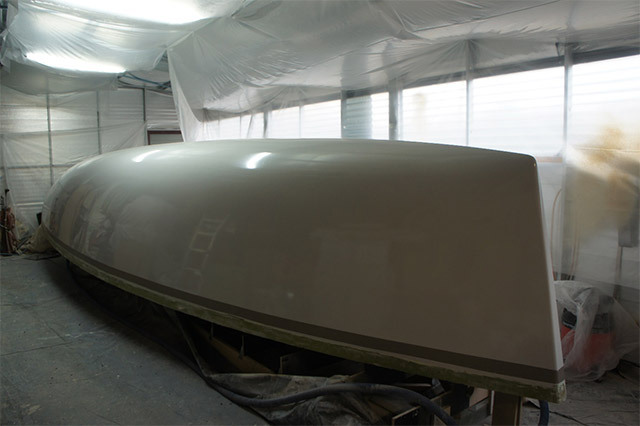 We delivered recently a custom design, where our customer was given wide choice to put in practice his dream boat. 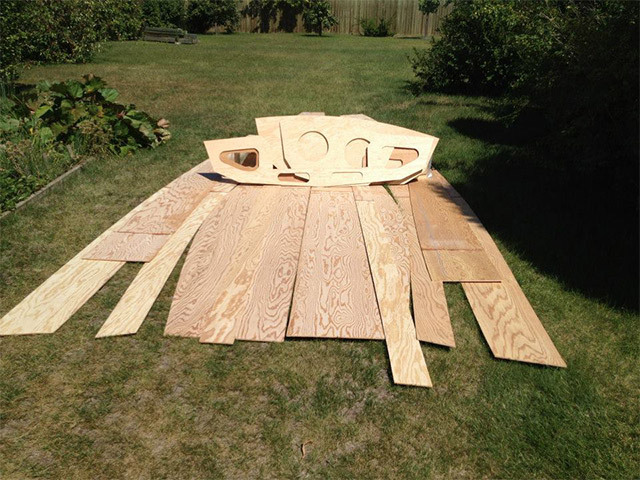 A curious fact it that this customer acquired the plans for the Pop Alu 32 design first, but then decided to go one step further and get an entirely new design. 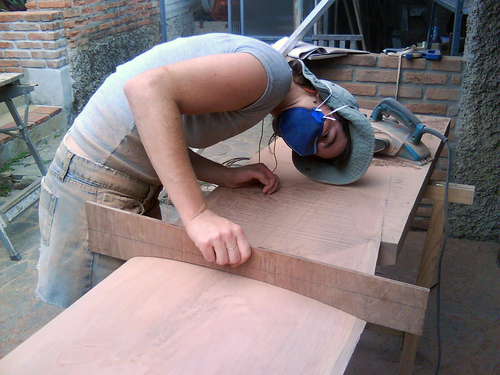 One more Kiribati 36 is coming along very nicely in the Southern Brazilian town of Santa Cruz do Sul. 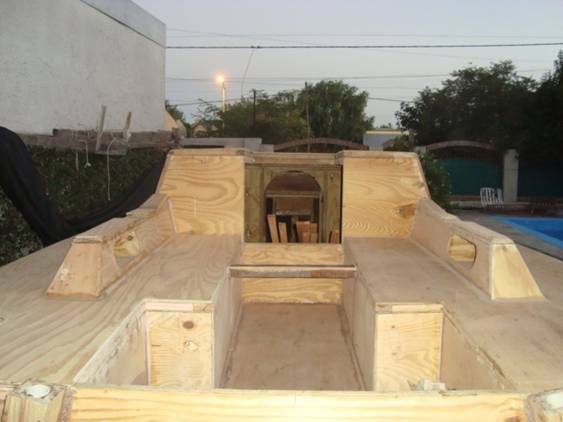 Her owner, Mr. Vanderlei Becker has bought the plans but not the CNC files, and is building the whole boat with traditional lofting methods, of which he had no previous knowledge prior to this undertaking. 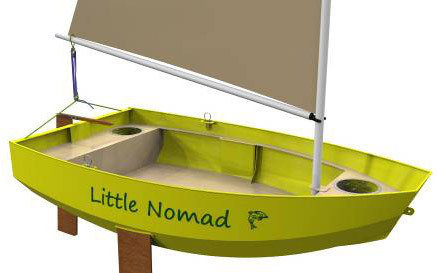 We designed the Little Nomad as an ideal tender for medium sized cruising boats, where often the budget does not allow for the purchase of a conventional life-raft on top of a working tender (of course local regulations concerning life rafts have to be respected, so please check with your authorities if you can sail without one). 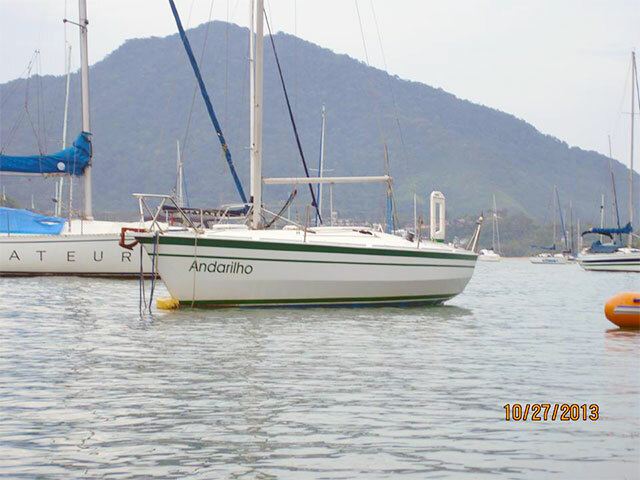 Following previous updates, we are happy to see that the first Pop Alu 32 has performed very well on her maiden open water voyage, one that can be considered the most difficult passage to attempt along the Brazilian coast, from Rio Grande to a coastal town near Rio de Janeiro. 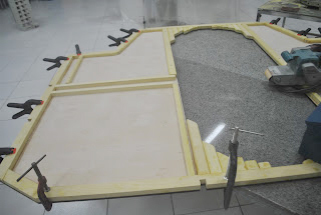 We received excelent news this week: The first Pop Alu 32 is about to splash, as told by Mr. Jairo Oliveira, owner at Ilha Sul Construções Náutics, from Porto Alegre, Brazil. 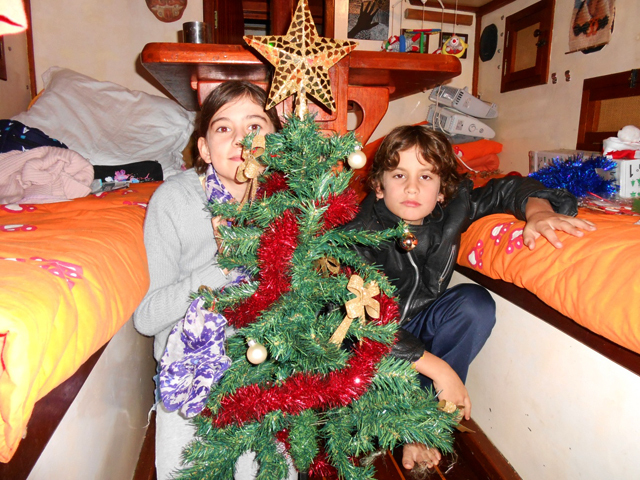 Good things are happening in the Pantanal 25 Class. 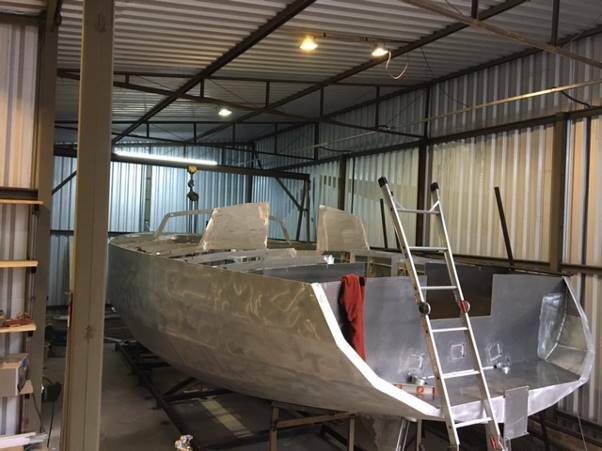 Many boats are being built in different countries, some in the final run to the completion and new builders are preparing to start the fabrication of their boats. A lot is happening in the Kiribati 36 class! 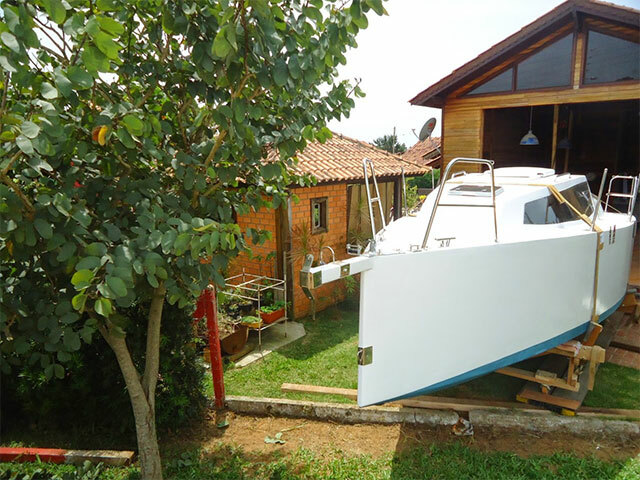 Hull number 2 of the series is already sailing, and judging by the owner's comments bringing a lot of satisfaction to the owner, Mr. Jone Martins, from Porto Alegre, Brazil. 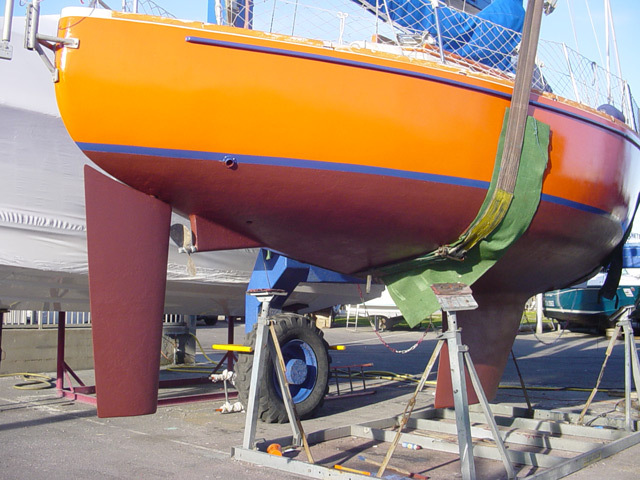 Following the design concept of the immensely successful Pop 25, already reflected in the Pop Alu 32 and furthering some concepts, we are introducing a new design in our line of twin keelers, now with 28 Ft (8.50 m LOA). This end of 2015 a small fleet of yachts built from B&G YD plans is moving to the Caribbean, not properly together but in contact. We designed this small dinghy with the dimensions that allow it to fit on the fore deck of the Kiribati 36MK2 design, with the intention of providing not only a tender for a blue water passage boat but also a dependable survival boat. 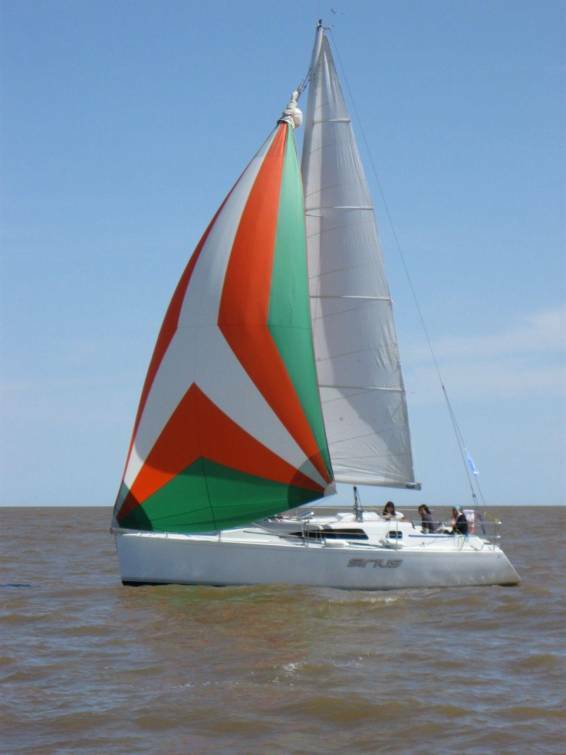 The first Pop Star 21 built up to now had her maiden sailing in Argentina. Her owner sent us a short video about the event, which we are reproducing below. 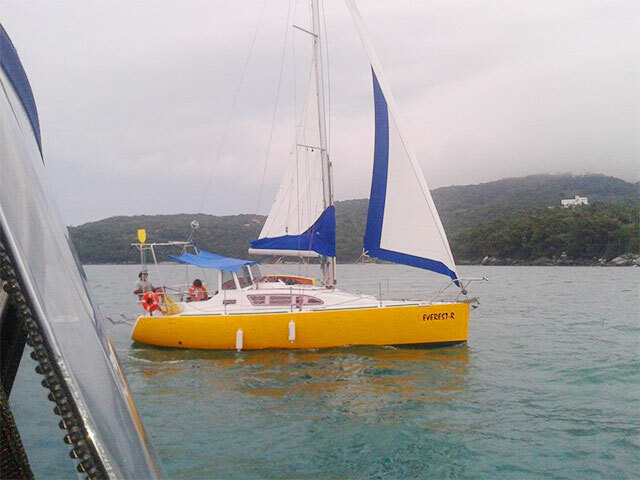 We have a wide variety of stock plans belonging to different segments of nautical interest, either for sportive leisure, or for commercial purposes. It is becoming trivial among the community of Pop 25 owners to affirm that building the Pop 25 is duck soup. 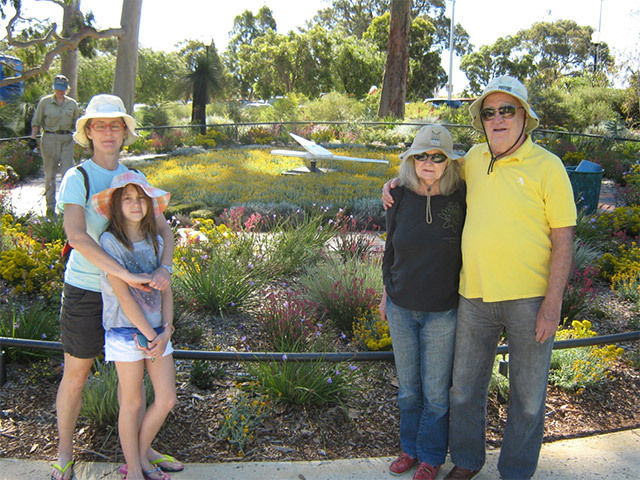 Paul Greblo owns a wine growing farm in Bendigo, Victoria, Australia. 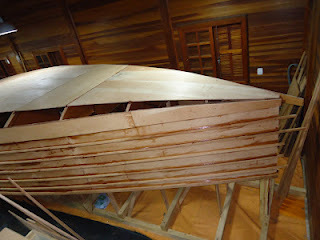 He is building a Pantanal 25 camping sailboat at his workshop in his spare time. It was the first time in the history of the office that one of our builders made a poem for the boat built with his own hands. A swallow never migrates alone, says the legend. 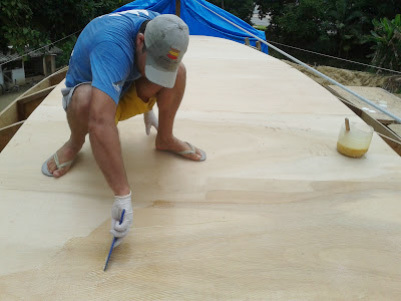 However in the case of our dinghy Andorinha (Swallow in Portuguese), one of our most popular stock plans for amateur construction, this old saying didn`t work so well. Since my adolescence I had a fascination for the explorers who pioneered in revealing to the world the most remote corners of our planet. 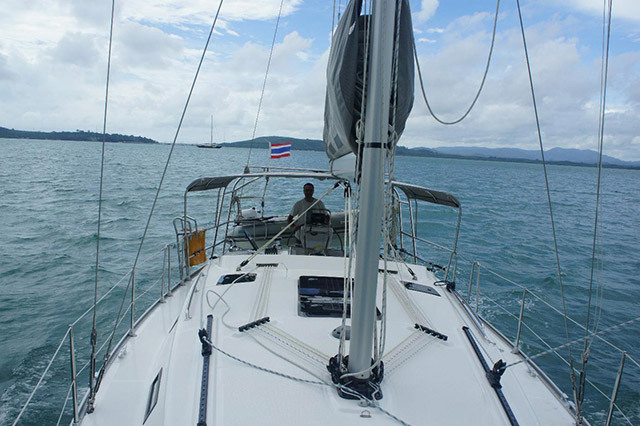 Sailing offshore onboard a cruising sailboat, be it in the company of the family, or with friends, or even in solitary, is one of the best ways to break free from it all, and it may become one of the most exhilarating sensations one can experience. 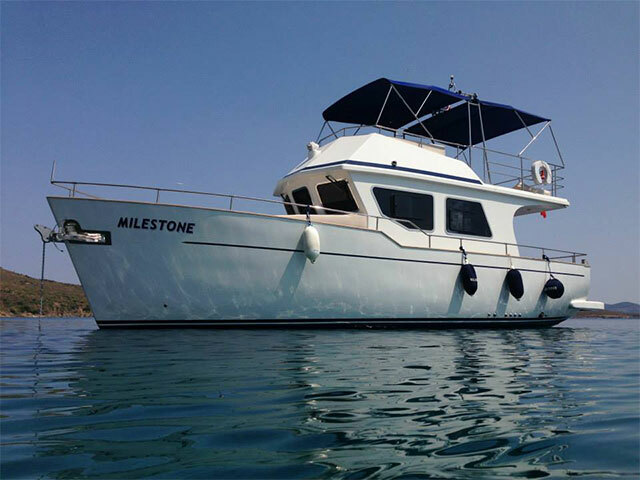 Since the Curruira 33 ‘Milestone” was launched in Turkey many people has contacted us enchanted by her beauty and style. If there is one of our stock plans that is being recognized as a contribution for the cruising community, this project is the Samoa 28. 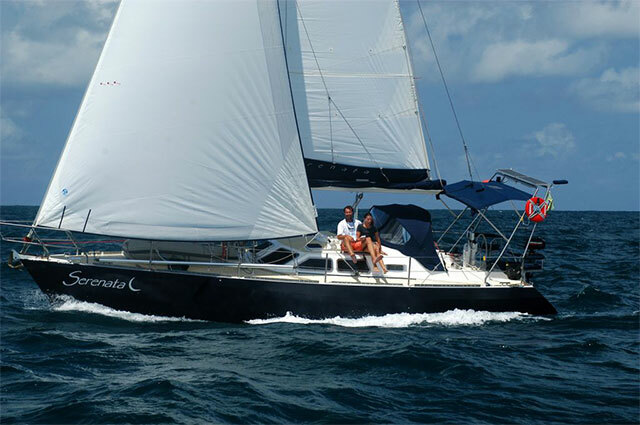 We just published an article about the MC28 class, informing that or friend Roberto Roque, the owner of the MC28 Stella de Fioravante, ex-Fiu, had sold his boat and acquired the MC34/36 Gibraltar, which is an enlarged version of his former yacht, with more room to spare and more inertia to face stormy weather when accomplishing a hard passage. The Pop 25 class is steadily gaining prestige. 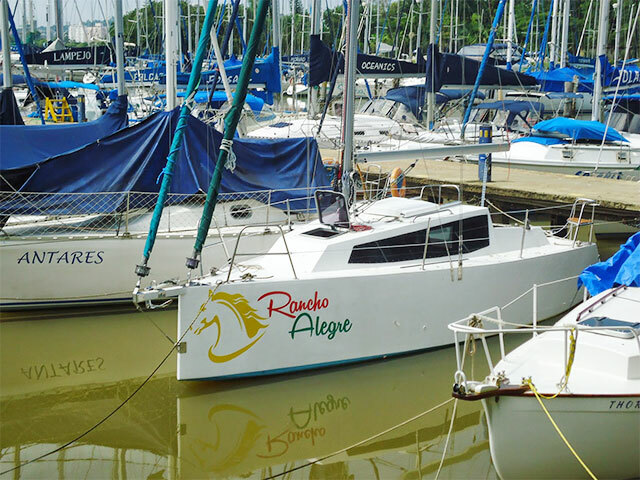 Now it was the turn of Rancho Alegre, built by the amateur Francisco Aydos in Rio Grande do Sul, Brazil, to show the potential of the design. 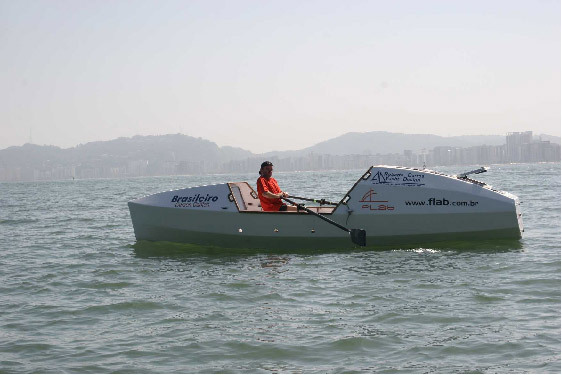 The boat is proportioning undreamed fun to Francisco`s family, bringing a feeling of accomplishment nice to be seen. 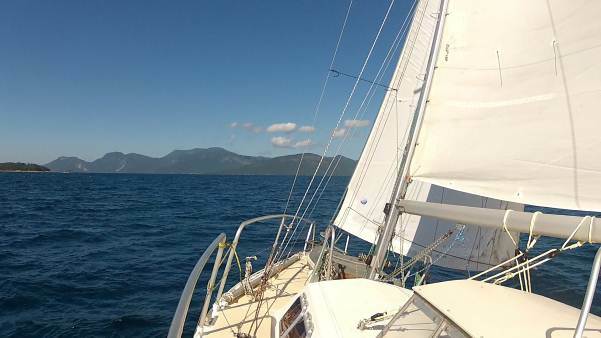 I wonder how many persons would like to own a fin-keel sailboat capable of accomplishing coastal cruising in comfort and safety, costing very little to be built and taking a short time to be concluded. The MC 28 Fiu was built by me with the help of my wife Eileen. 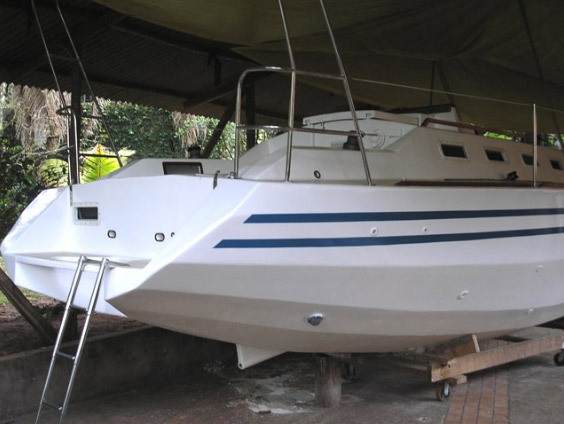 The work took a few years to be concluded and the boat was launched in 2000. 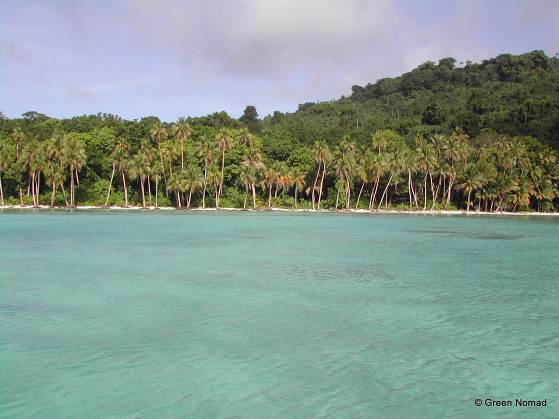 Our intention was returning to the South Pacific where we lived the best years of our lives. The Pop 25 class is showing a new pace of growth. 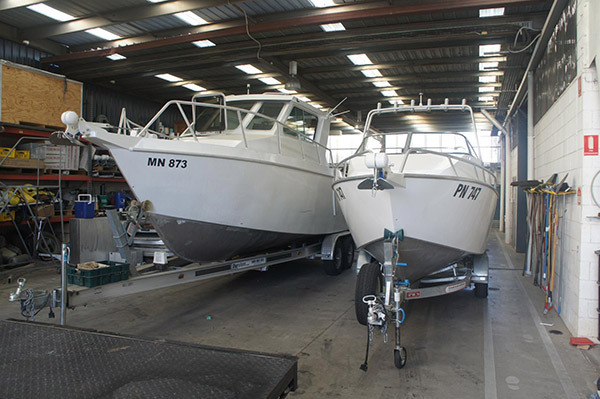 It is steadily increasing the number of boats that are being launched. The most recent one is Rancho Alegre. 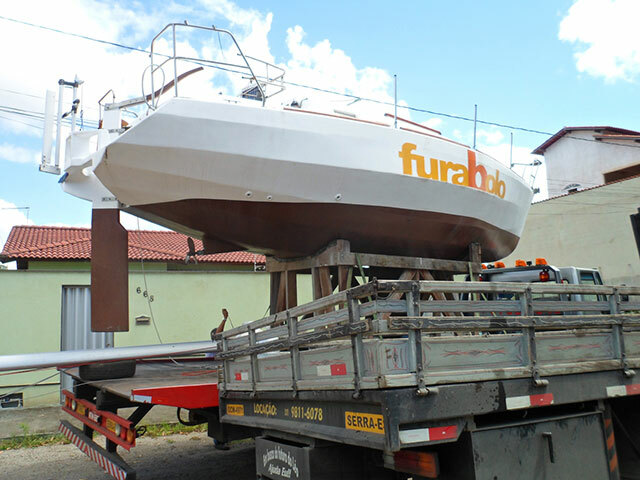 We received an email from our client and owner of Northmetalurgica Boatyard, Jean Abreu Machado, with pictures of the delivery of a completed hull of the Pop Alu 32 design. 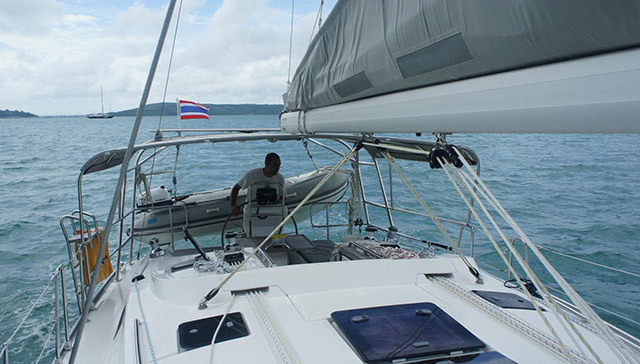 Leaving Green Nomad alone on a mooring or berth is never something we do easily, with a light heart. 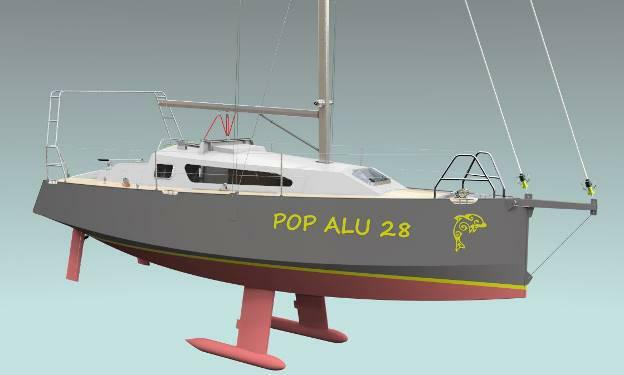 The Pop 20 is a design in our list of stock plans which we intend to promote internationally as the cruising sailboat fitted for our times, when only a few have enough money or dispose of unlimited time to spare in enterprises of the type do it yourself which take ages to be completed. 2015 is seeming to be the year of the Pop 25 class. The number of boats of the class under construction is quite impressive. 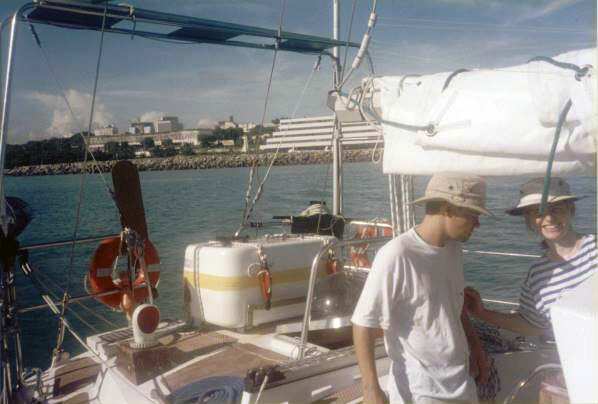 In 1997 we left Fortaleza, Brazil, bound for Tobago, in the Caribbean, on a 1450 NM trip that was to be the first big passage on our first boat, also named Green Nomad. 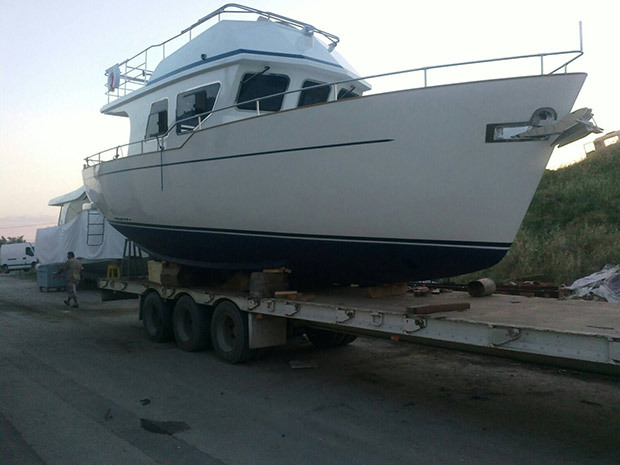 MC 28 Access, the globetrotter of the class, arrives in New Zealand. Flavio Bezerra is one of the wackiest clients/friends we have. 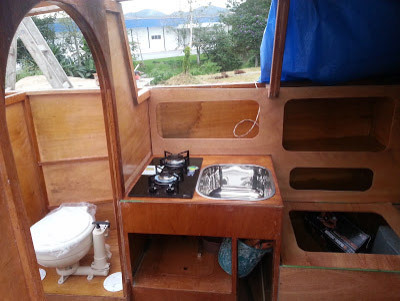 He built his MC28 Access in a place in Rio de Janeiro where there were gun fires regularly at night, and he slept in a small room next to the boat shed where the walls were pierced by bullets. This will be a promising year for the Pop 25 class. At least two boats of this design are getting ready for being launched. One of them, Rancho Alegre, built in Viamão, Rio Grande do Sul, Brazil, by Francisco Aydos, had been already shifted from the shed where she was built to the Club Veleiros do Sul, where she will be stationed. 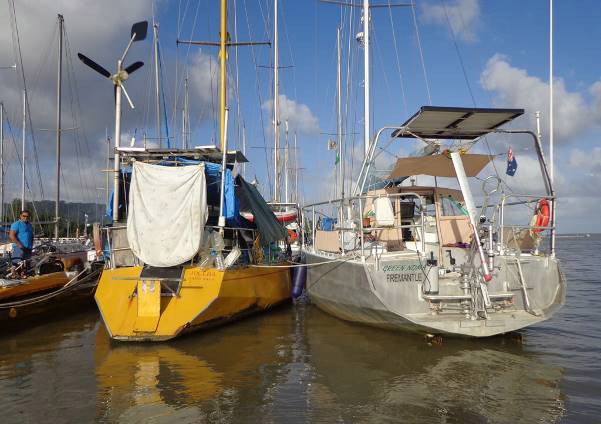 We wrote this article with the intension of telling how a dream of owning an offshore cruising sailboat can become a way to break free from the oppressive atmosphere of urban centres. The Samoa 28 is the cruising sailboat capable of passing through storms with less discomfort than most other sailboats of approximately the same size. A short time ago one of the participants in the Volvo Ocean Race provided with the state of the art navigation equipments went aground in shoals in the Indian Ocean, a navigation flaw that not even the simplest of the cruising sailors owning a hand-held GPS would probably ever do. 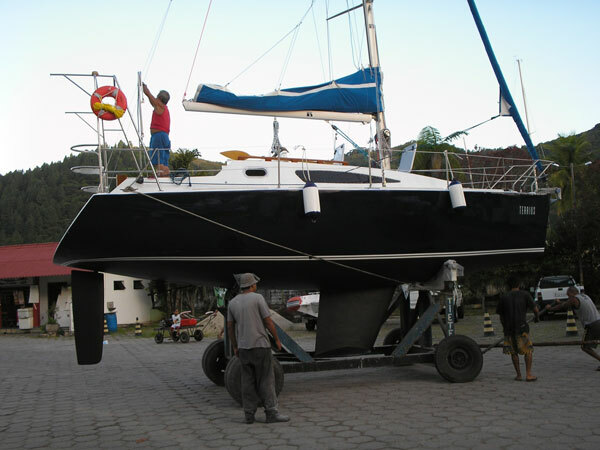 Being passionate enthusiasts for cruising under sail and loving camping in family, we from B&G Yacht Design felt that we had almost an obligation in developing a trailerable sailboat project capable of proportioning lots of fun. 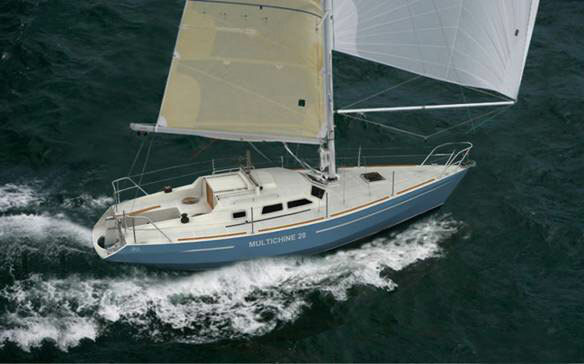 When designing the MC34/36 some years ago we had in mind to offer to the cruising sailors an authentic blue water sailboat that would proportionate about the same comfort as many forty footers. It is already a B & G Yacht Design tradition to promote twelve boats from our designs which accomplished some sort of outstanding achievement, or were recently launched along this year. 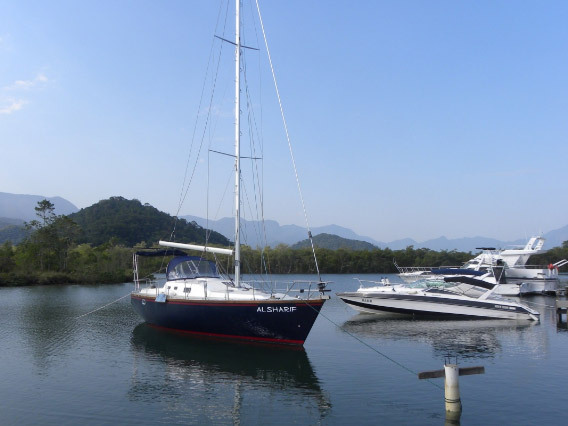 The MC28 class is spreading its presence in the nautical communities of different countries, being recognized as a proper boat to attempt offshore adventures. 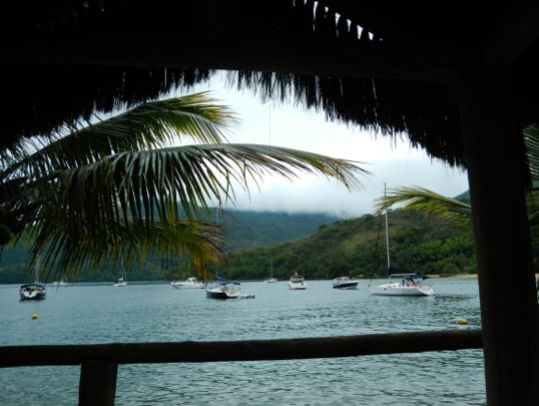 When leaving Tahiti behind I also parted from my encounter with the past. My next call was scheduled to be New Zealand, a place where, in spite of being my wife`s family country, I never had been before. 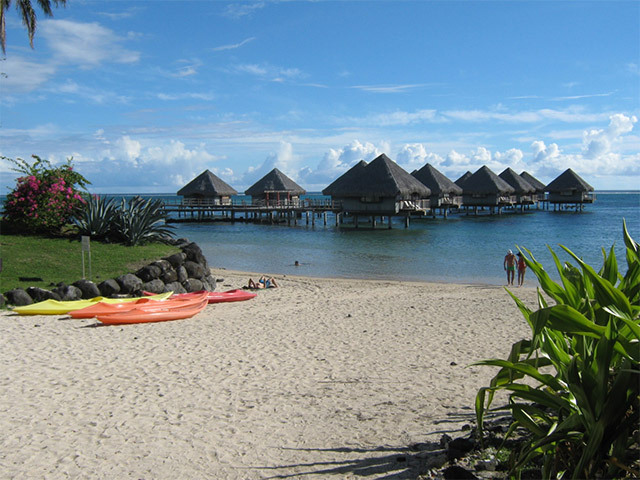 The next call in my return trip to Australa was Faaa Airport, Tahiti. This stop over had a strong emotional appeall to me. It took place on that same spot of our departure from the paradise Island where we spent the happiest times of our lives. 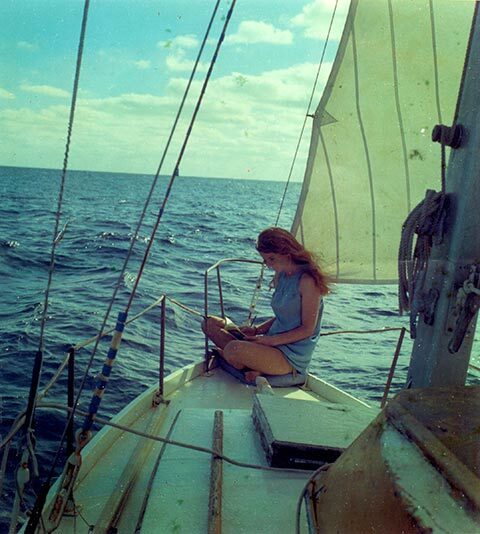 During the late sixties my wife Eileen and me were in the way of accomplishing a voyage around the world aboard the 25 foot cruising yawl Sea Bird, when calling at Tahiti, the trip had to be interrupted by the birth of our daughter Astrid. 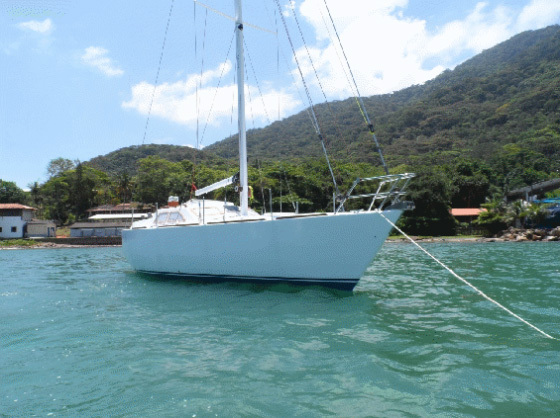 Revista Nautica, the most prestigious Brazilian nautical magazine, published a report about the B & G Yacht Design Pop 25 cruising sailboat project, testing the first boat of the class to be launched in that country, the office’s “enfant terrible” designed for amateur or professional construction, which is doing a promising career among the office’s line of stock plans. We just received new photos of the first Pop Alu 32 to receive a name, the Samsara II. 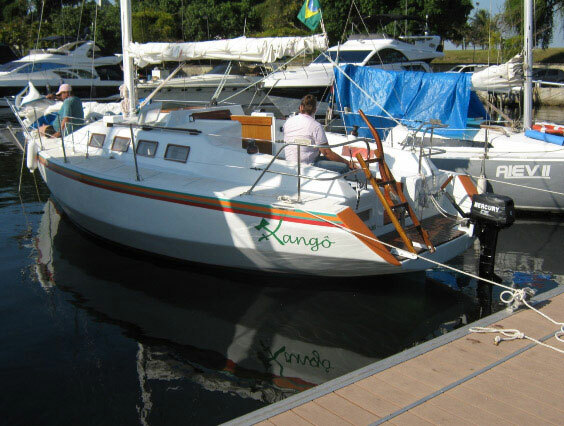 Samsara II was built by Ilha Sul Construções Náuticas boatyard, from Porto Alegre, Southern Brazil, for our client Ronei Schwindt, from Santa Catarina State. The Pop 25 builders’ community is increasing in numbers at a fast pace. 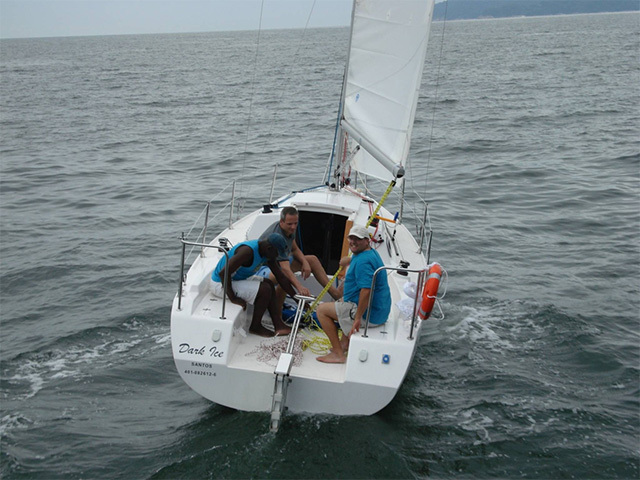 Our clients are making their boats investing the most of their wits and stamina to complete their accomplishments. 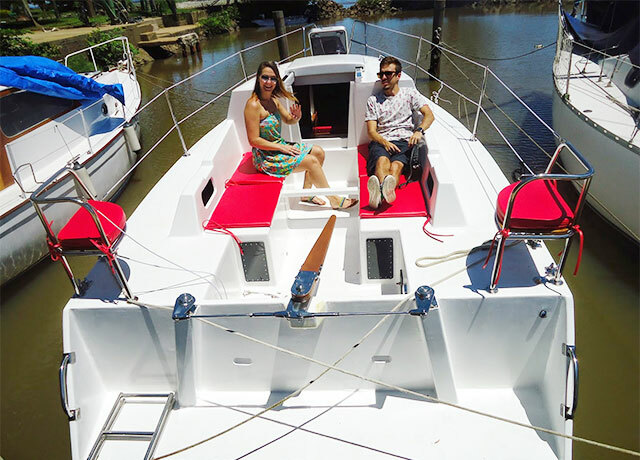 We received this friendly e-mail from our client Fábio Fabbris Fabbris, who built the MC 28 Bagual, one of the most well built boats of her class. 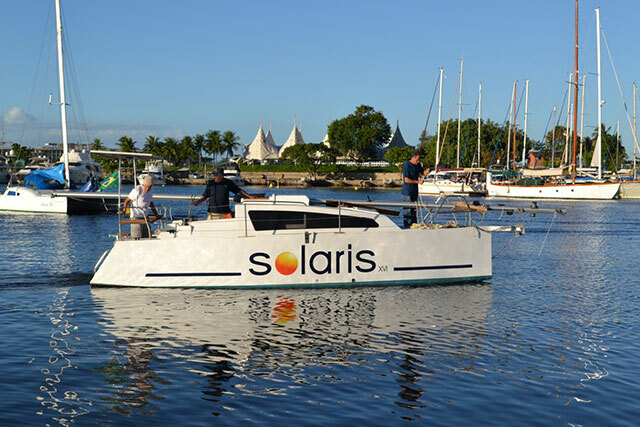 Solaris, the second Pop 25 to be completed, was launched this April, 28, in Rio de Janeiro. 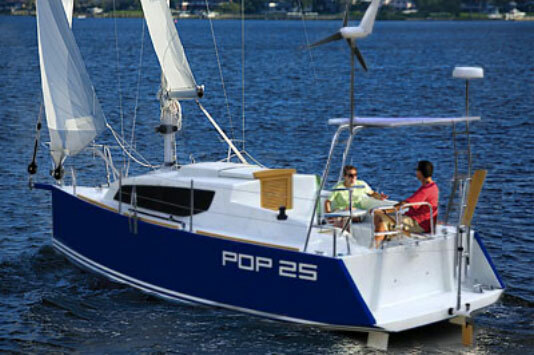 The Pop 25 project intends to offer simplicity and reliability as its principal aims. The basic idea when developing the project was to suggest electric auxiliary propulsion as first choice. We received the email message below from our friend and client Paulo Ayrosa, owner of the Multichine 41 SK Bepaluhê. 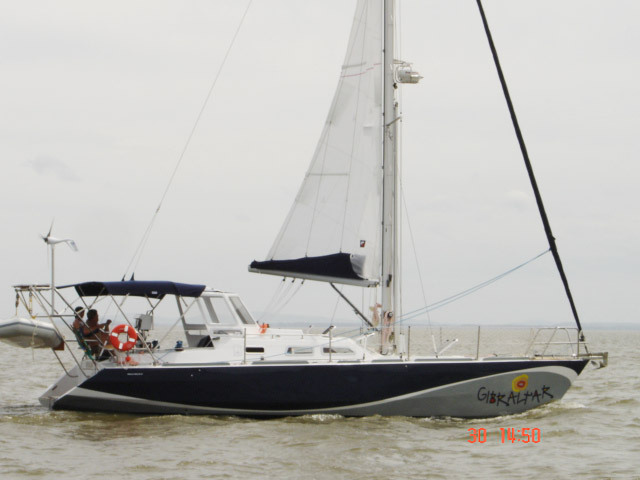 The MC28 Ipe is the youngest member of the class fleet. 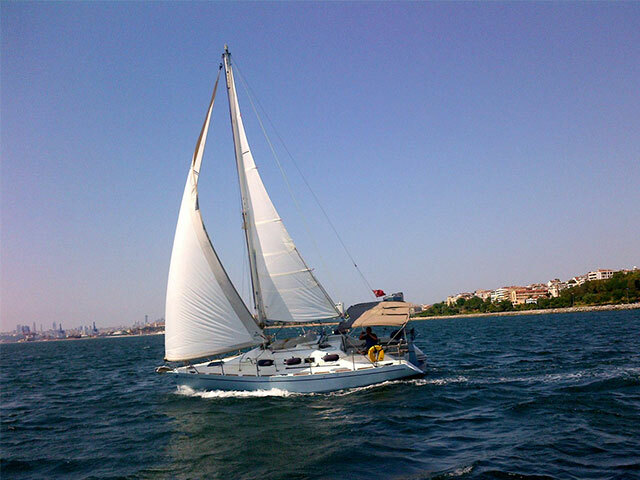 She was launched in March 2014 and was already tested in a day-sail. Just imagine taking your boat to a different cruising ground in a Saturday morning and in the afternoon be sailing in a place two hundred or more kilometres away, dropping the anchor in a nice haven to stay the night, to wake up in no hurry on the next day, have another sailing time, or just jump in the water for a swim around the boat and at night be back to your place. Solaris, the Pop 25 being built in Rio de Janeiro, is almost concluded. 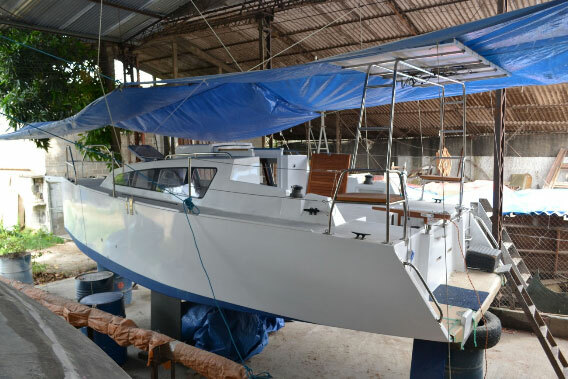 Her owner, Fernando Santos, is building the sailboat of his dreams, a true offshore sailing machine capable of performing the cruising trips he had been longing for. 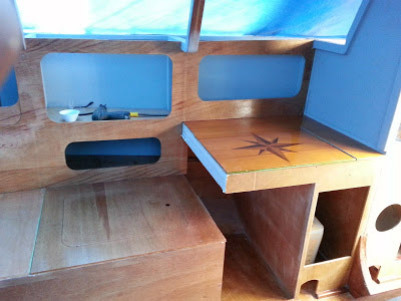 Howard Bennett, who is building a plywood/epoxy MC34/36 in Dunedin, South Island, New Zealand, upgraded his logbook (Multichine 34/36 Cabin Boy in our list of links, or www.nzcabinboy.blogspot.com) reporting how his construction is at the present stage. We are happy to report that very soon the Kiribati 36 class will have one more representative sailing the blue ocean. Every so often, when strolling along the Swan River margins, in Perth, Western Australia, where I live, I keep wandering what type of craft would suit best for gunk-holing those placid waters. 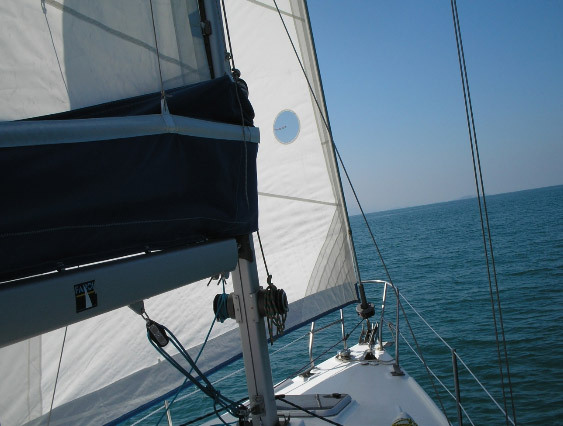 Sailing may be considered one of the most important inventions in history. It was by means of sailing crafts that commerce prospered in the Indian Ocean and the Mediterranean in the old age. Maitairoa, the boat designed and built for the "day after"
It was revealed a few days ago the speech the Queen had ready to be pronounced about the third world war. This speech was written exactly thirty years ago, the time for state documents considered of strategic importance to turn public. We have great news for the Pop Alu 32 design. 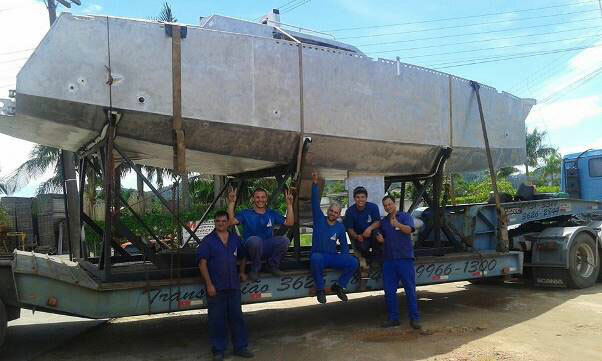 The first hull fabricated has just been sold to a customer in the southern Brazilian State of Santa Catarina by Ilha Sul Construções Náuticas boatyard. 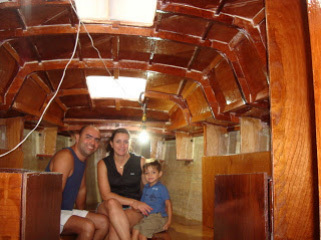 Imagine a family who built a twenty-five foot sailboat in their home backyard along two years of pleasant work. 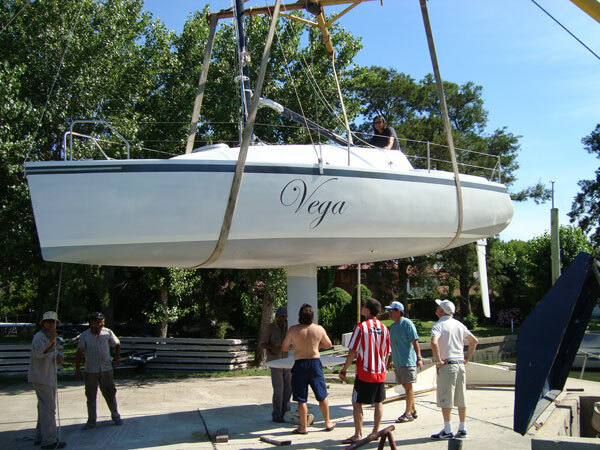 When concluding the construction the boat was taken to the club to be launched. The Pop 25 now has an illustrated building manual written in English. 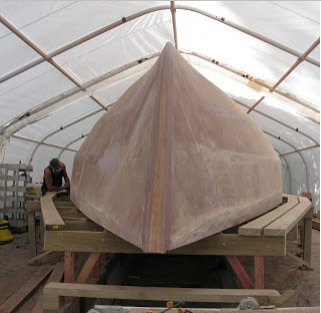 While the first boats of the class were being built, we learned about the doubts our clients were facing during their construction, and concentrated on those topics so not to leave other builders with extra difficulties. Our client Ömer Kirkal is sharing a good time with his friends aboard Evrensel, the Multichine 26C he built in his home garden in Istanbul, Turkey. 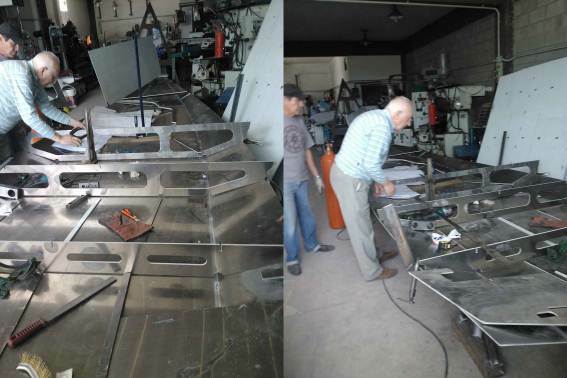 This first unit is being built by our client and friend Walter Baitella, from Córdoba, Argentina, who was also the first client for the Pop Alu 32 design. Now it is the turn of the MC26C class to show its face. Every so often we receive e-mails from our builders praising the characteristics of the project. 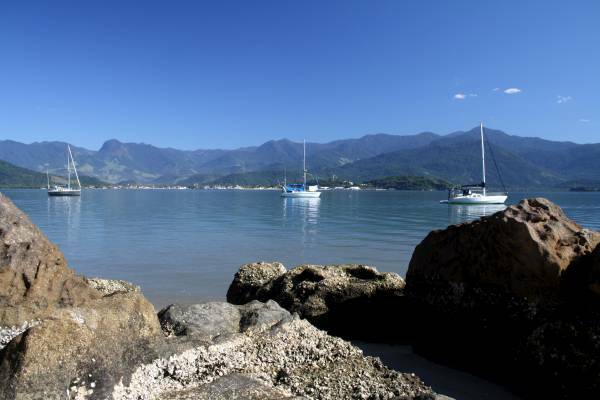 The Saco da Ribeira Bay, in Ubatuba, northern shore of the State of São Paulo, Brazil, is an amateur construction hub of offshore cruising sailboats in the country. 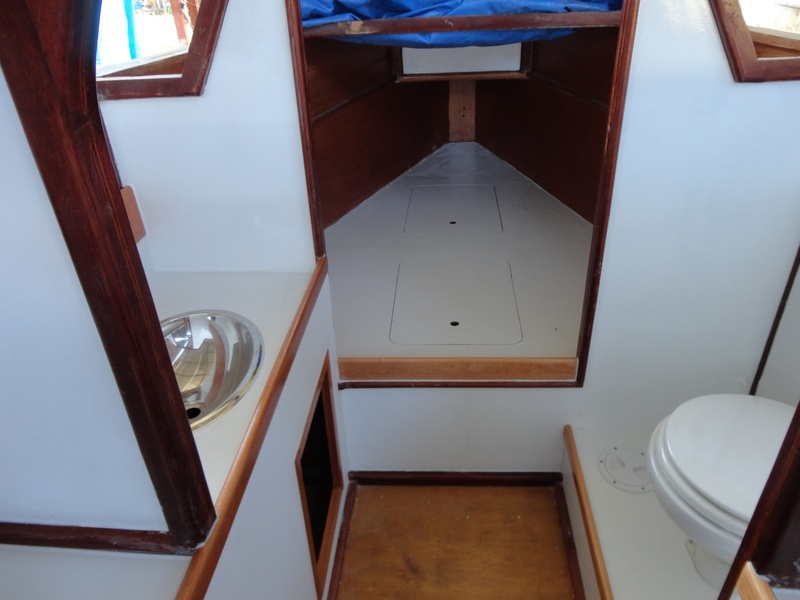 What sailors most praise when being onboard an offshore cruising sailboat is to feel like being ashore, as if profiting from the cosiness of their homes. Recently we were contacted by Mr. Hugh Bennet asking for permission to use the design name and images of our Kiribati 36 design in a postal stamp issued by the Republic of Kiribati. It’s being clear sailing. 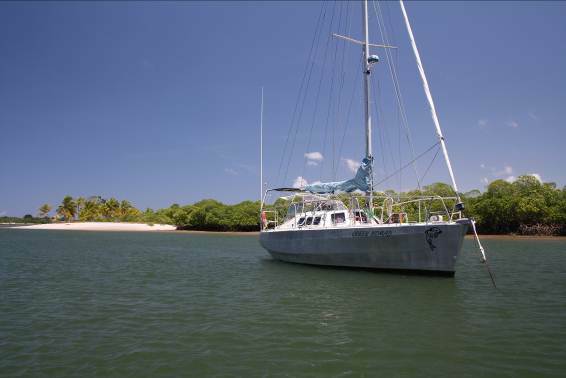 Green Nomad, the Kiribati 36 built by our partner Luis Manuel Pinho and his wife Marli Werner in Porto Alegre, South Brazil is already in the northeast of the country, sailing far from shore, bound for Camamu, a popular tropical paradise among the international cruising community. In September 2013 another boat of the MC 26C class was launched. 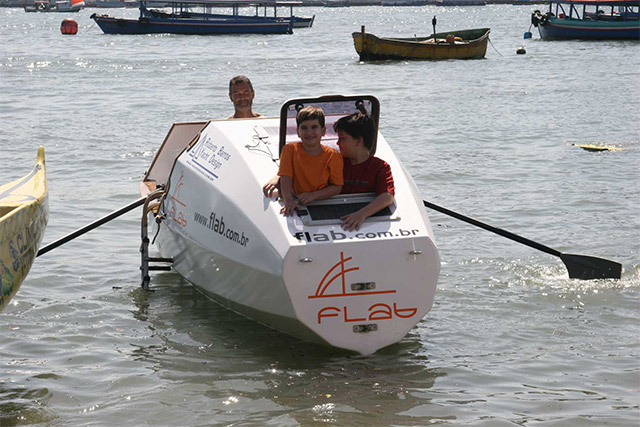 The boat in question is Furabolo (means pricking the cake in Portuguese). Now it’s for real. 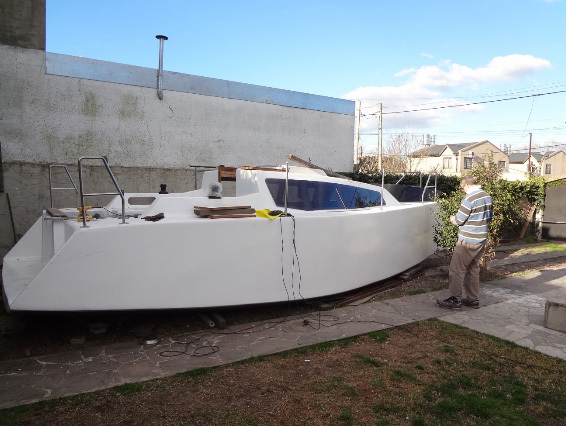 We received an e-mail from our Argetinean friend Daniel D’Angelo, from City Bell, Buenos Aires, telling us that the Pop 25 Horus he is bulding with the assistance of his partner Alejandro is nearly completed and is scheduled to be sailing during the first days of October. 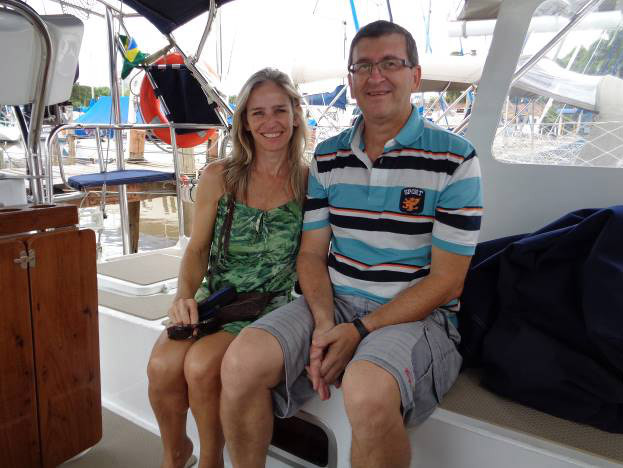 Just recently my wife Marli visited Ilha Sul Construções Náuticas boatyard in Porto Alegre, Southern Brazil, and had the opportunity to see personally the first hull built to the new Pop Alu 32 design. By the time we were finishing the work in South Korea and were preparing our return to Australia we thought we deserved a holiday to recharge batteries after two years of hard work building the drill-ships. There is nothing more frustrating than having a dream that can’t be achieved. 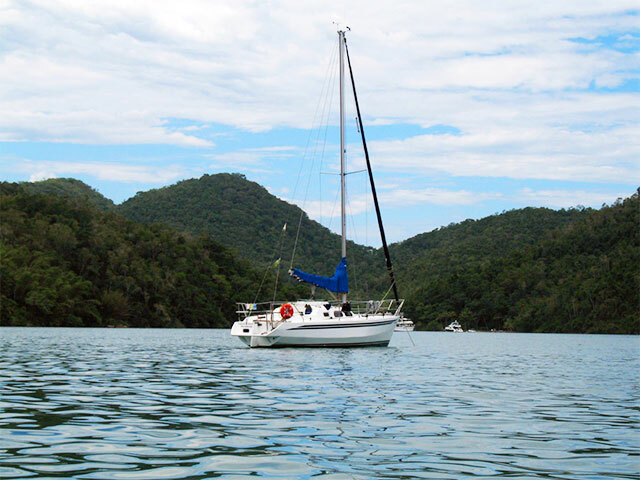 Cruising under sail is an activity that can bring endless pleasure, however it might be a distant dream for many. It is as if we had climbed into the cockpit, and in a flash could see all the scenery that was left behind. 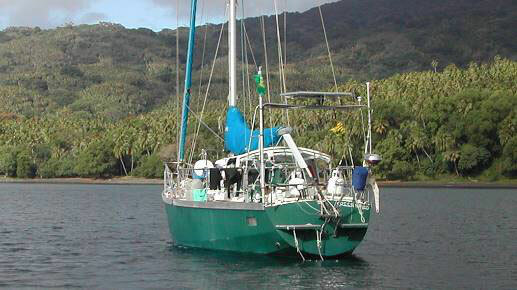 The Samoa 34 is one of our most important offshore cruising sailboats. However we must admit that its description in our site was less than the design deserved. We think it is sweet when a family joins efforts for the accomplishment of a dream. This is what is happening with the construction of the Pop 25 Konquest, which is being built by the brothers Marcelo and Vandeli Schurhaus, in Santa Catarina, Southern Brazil. 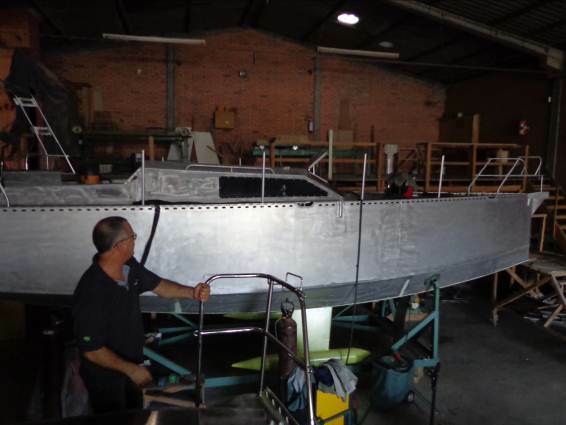 We are beginning a collaboration agreement with Plate Alloy, a company specialised in producing aluminium kits for pleasure crafts intended for amateur construction. And so our praised builders Howard and Noelle Bennet returned from their planned trip to England, and setting up shop again, turned over Smoko, the home-made MC36 being built in their farm in Dunedin, South Island, N.Z., providing a show of good planning and competence seldom seen among our amateur clients. Good news came from Turkey. The news came from this amazing country, which is thriving in prosperity while its neighbours from the European Union are enduring difficult times with their sluggish economies. 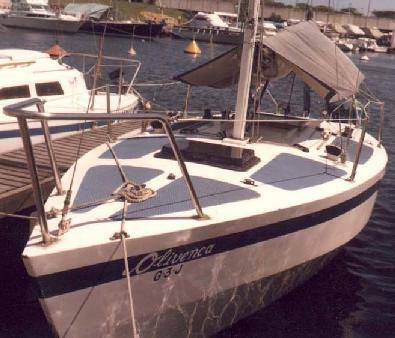 It was there that the first Curruira 33 was launched. 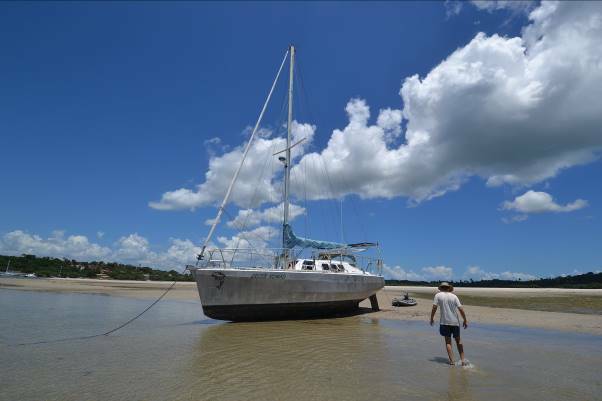 I have been asked to provide a description of how SSB played an important and enjoyable part in our 10 years of cruising in the Pacific Ocean, period in which we have even spent 3 cyclone seasons out of the main centres of Australia and New Zealand, usually the refuge for cruising sailors during the Southern hemisphere summer. And so we took our leave from Picton and headed south. It was dark by the time we reached Dunedin but the journey back was spectacularly uneventful with no sign of the threatened storm force winds for which I was immensely grateful. Designing a new project is a wonderful amusement. When producing the drawings one of our greatest pleasures is searching new ideas which could help people, be it in port or offshore, feeling safe and comfortable while staying inside the cabin. It’s already a tradition the Porto Alegre to Rio Grande rally that takes place during summer along the inland sea called Lagoa dos Patos. 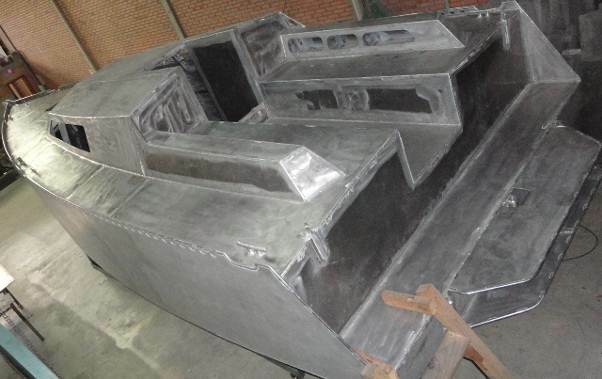 It has been finalized in Porto Alegre, Southern Brazil, the first hull of our new aluminum design in kit form Pop Alu 32. A group of persons involved with the Pop 25 class keeps narrowing its laces of friendship. It’s as if the class were a large family with its members participating of mutual achievements. 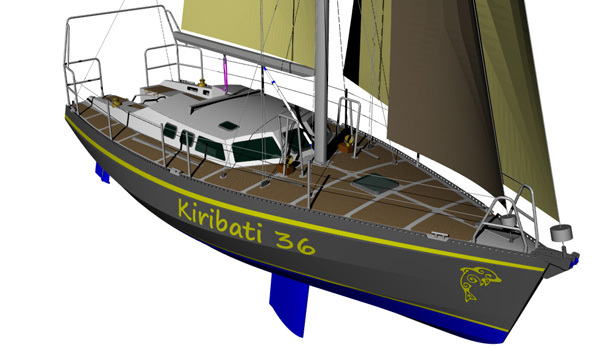 After 5 years we decided to revise and upgrade the Kiribati 36 design, incorporate some ideas that came after the prolongued use of Green Nomad and add design details that were once doubts and questions forwarded by the first builders of the design. After a sojourn in Asia our yacht design Office is back to Australia. This overseas stay was a rewarding experience, as much from a personal standpoint, as professionally. When I was living in South Korea I received a proposal to take part in a different job. 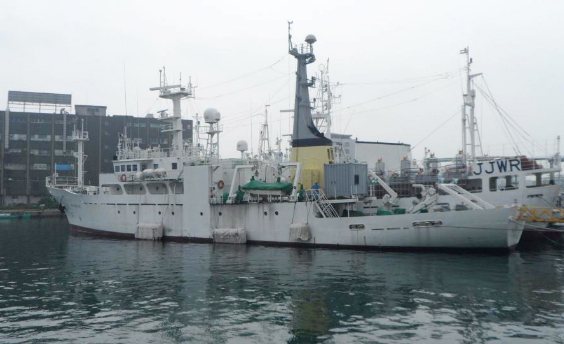 By indication from Luis Manuel the people from the Sea Shepherd Organization contacted me asking if I was interested in surveying a ship that they were interested to buy to increase their anti-whalers fleet. 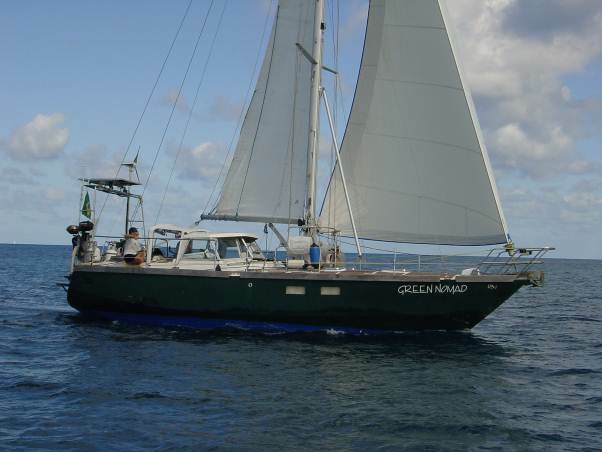 After 6 months with NGO Sea Shepherd now it is time to get back to Green Nomad. Our trip with the new boat is progressing slowly, but we believe that standing up and fighting for the preservation of the life in the oceans is vital, and no life no ocean to go sailing in. 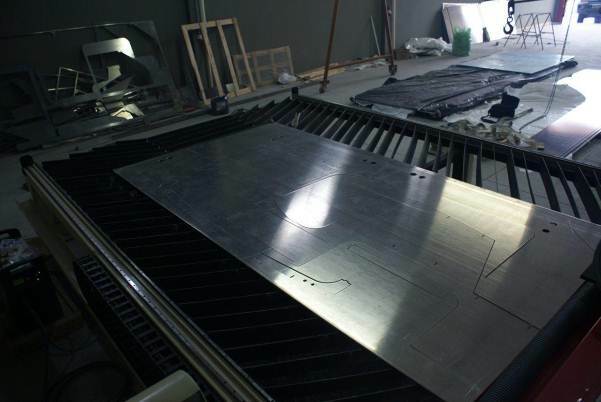 s it is supposed to happen in any yacht design studio, we are constantly developing new products, be them new projects or up-grades for already existing projects. 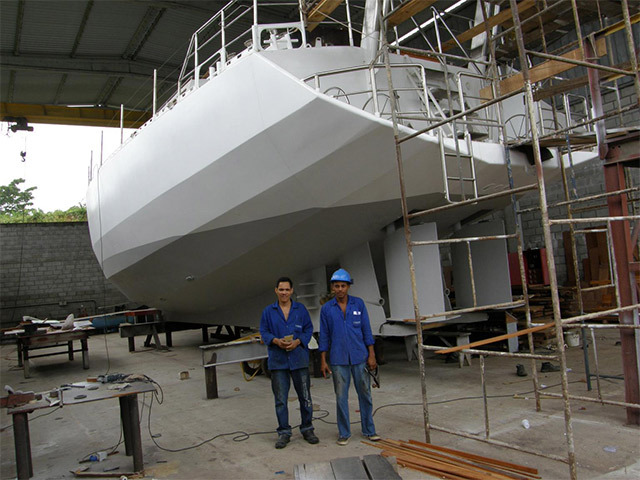 B & G Yacht Design is traditionally known for its involvement with cruising sailboat projects. 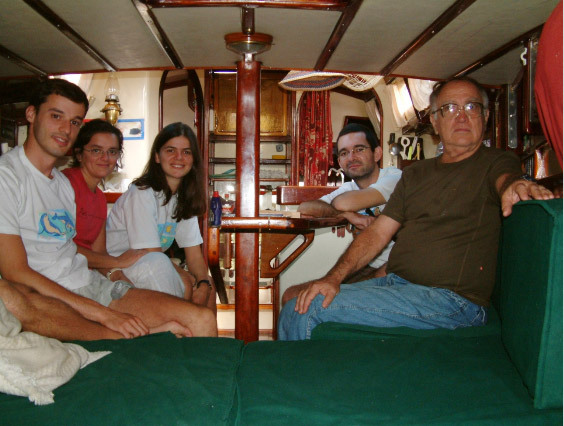 Since the beginning of the company, in the late eighties, our team had the desire to help dreamers of all ages to be able of going offshore in crafts that could be trusted of coping with whatever surprise the weather had to offer. Good news for the Pop 25 class. 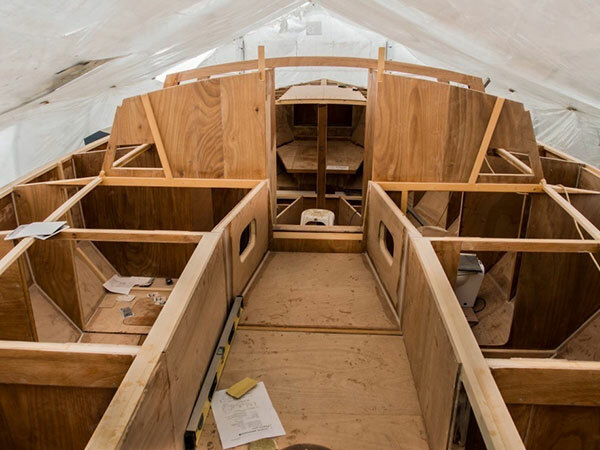 Those builders who turned their hulls recently are progressing at full throttle in the construction of the interior, while those who have their hulls almost finished are getting ready for the turning over operation. It looked as if it was intentional. 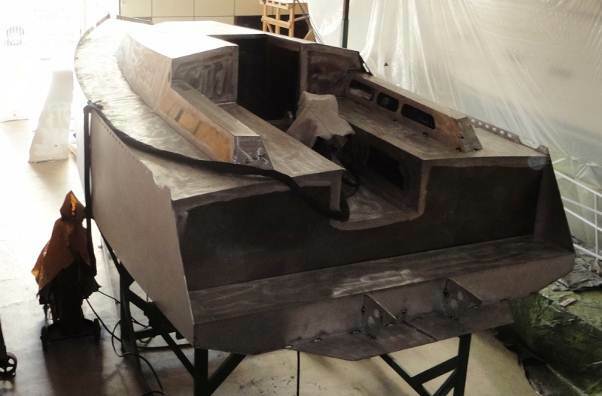 Three Pop 25 hulls were turned upside in a row. They were Solaris, being built in Rio de Janeiro since August 2012, having the hull turned over in December 2012, Rancho Alegre, from Porto Alegre, Southern Brazil, whose hull was turned upside this February, and Hayal, being built in Turkey, this one being turned over in March. Yacht designing can be a very challenging activity. 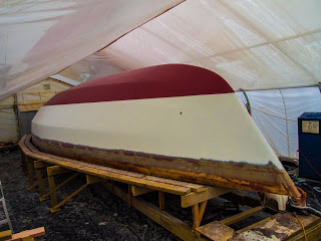 When a project is started, it’s given to the designer the opportunity of either producing a craft that can fulfil the needs of sailors, or simply designing a boat that resembles others, without deeply involving in any special feature that will distinguish it specially. 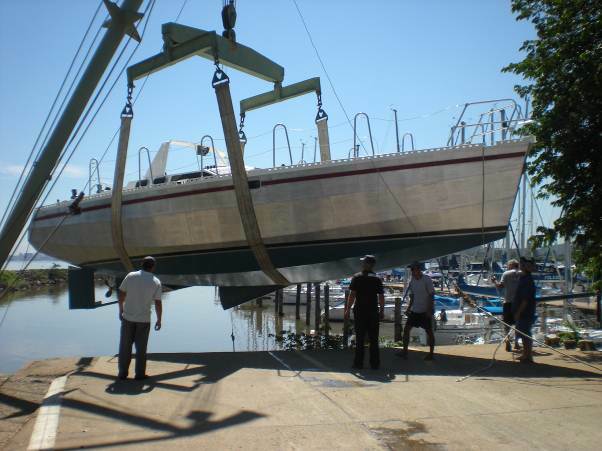 It comes from Turkey the first Curruira 33 to get close to its launching day. 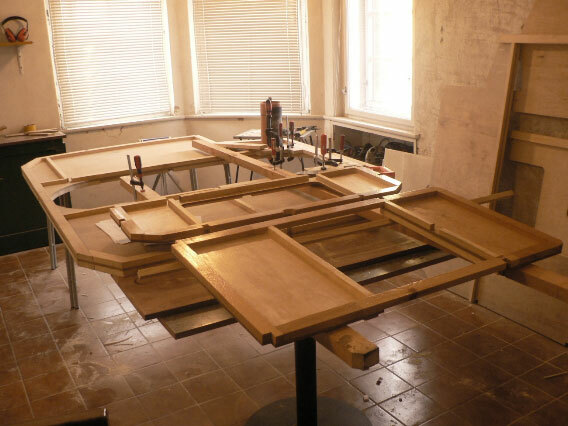 Our client Emre Yilmaz, is doing an awesome nice job with its construction, this being done in record time. 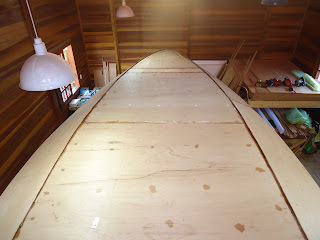 James Gyore, is constructing a Pop 25, Splash in Melbourne, Australia. 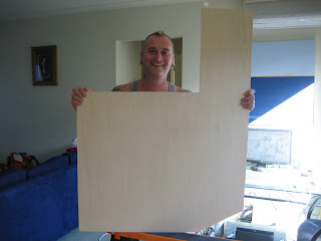 He is one of the staunchest Pop 25 supporters among our amateur builders. 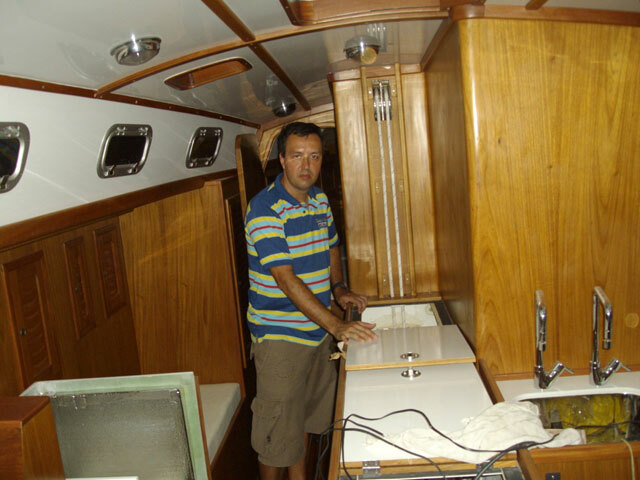 It is extremely rewarding for us from B & G yacht Design when an amateur builder who constructed one of our boats writes us informing that he became totally satisfied with his choice and that after a pleasant construction, discovered that the boat surpassed his expectations. Now it is clear sailing. 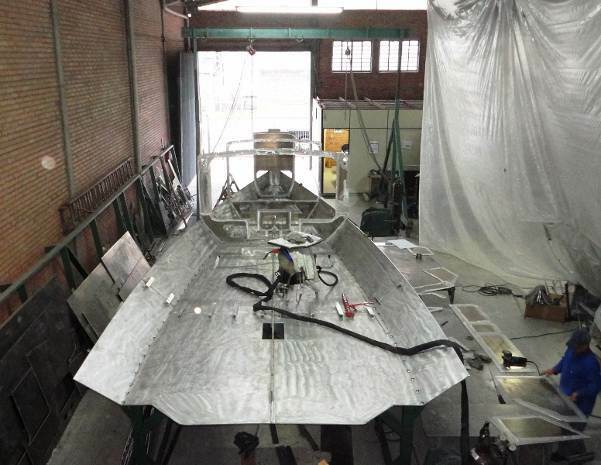 The Pop 25 Horus is almost ready to be launched. 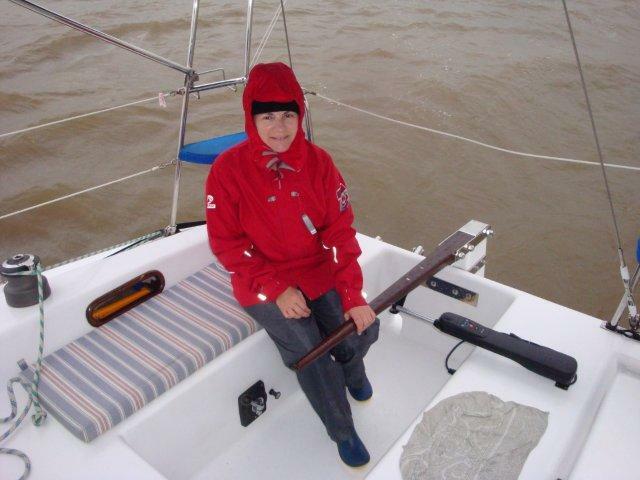 We received an e-mail from Daniel D’Angelo, our Argentinean friend who is building Horus in City Bell, Province of Buenos Aires, when he told us being anxious to see the boat in the water. Thirty years ago the double-ender Maitairoa left her building shed placed in a country seat located in the one thousand meters high hills north of Rio de Janeiro to start an adventurous career. 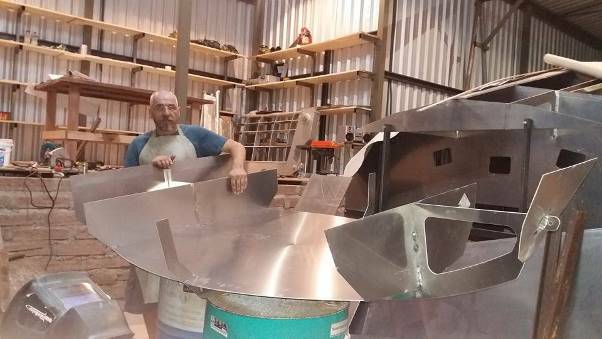 Our cliente Jean Abreu Machado is making available through his boatyard North Metalúrgica pre-cut kits that can make may amateur boat builder's dreams come. 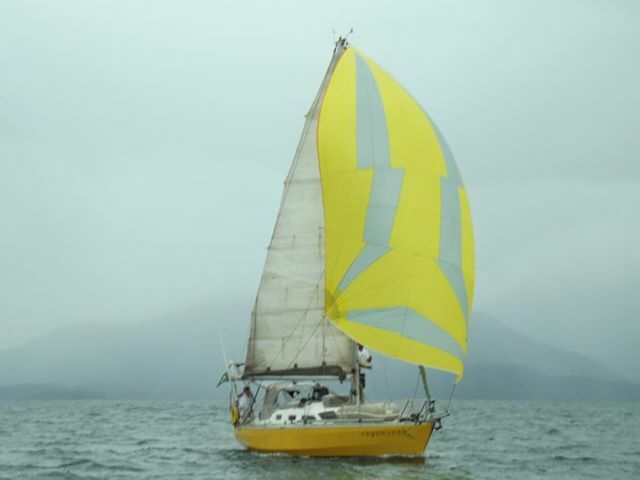 Caravela 1.7 - Beware of the Yellow Peril! This warning has nothing to do with Mr Bonnie statement made two hundred years ago about the geopolitical potential of the Empire of the Centre. 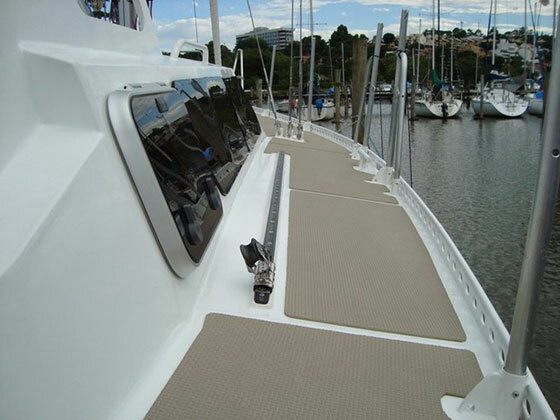 The MC 28 class is one of our most acclaimed designs. During the years since the class was introduced, every new builder that concludes the work becomes an enthusiastic supporter of the project, this being a boosting factor for the design prestige. No sooner did we publish the last article about the Pop 25 class in our news section, and an impressive number of fresh news fell into our email-box. 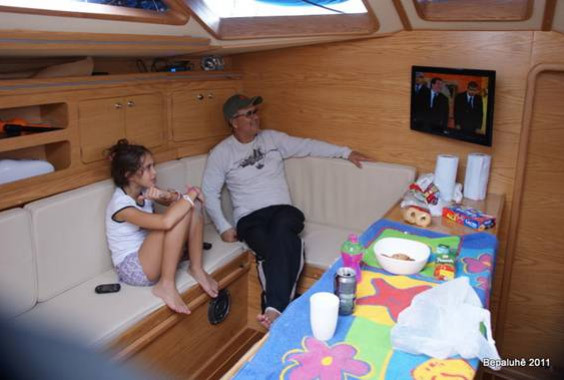 Sailing with your family in a cruising yacht is very good. 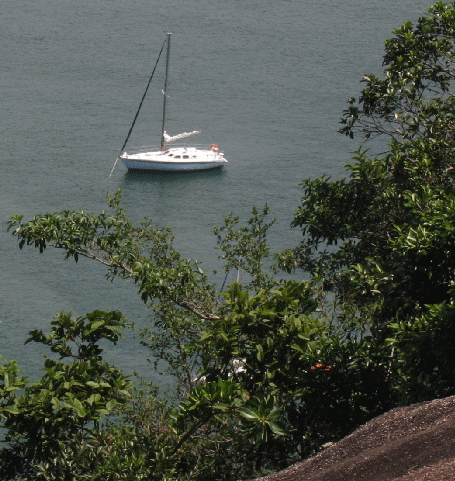 Sailing with your family in Angra dos Reis Bay between Ilha Grande and Paraty is much better yet. The race for the first Pop 25 to be launched is becoming a challenge of unpredictable outcome. A couple of months ago it was considered that Horus, the Pop 25 being built by our friend Daniel D’Angelo, in City Bell, Buenos Aires, Argentina, would win hands down. 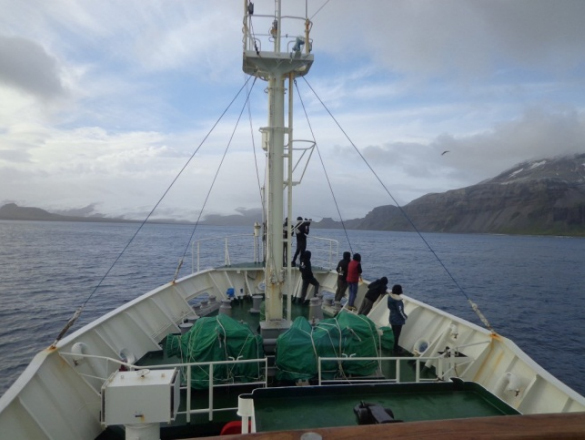 The Cabo Horn 40, one of our most important expedition boats, is constantly generating news about the class. Being one of our designs that keeps expanding in number of boats already completed and in geographic scope, this yacht is becoming an icon as being the right size of boat for a family to live aboard. 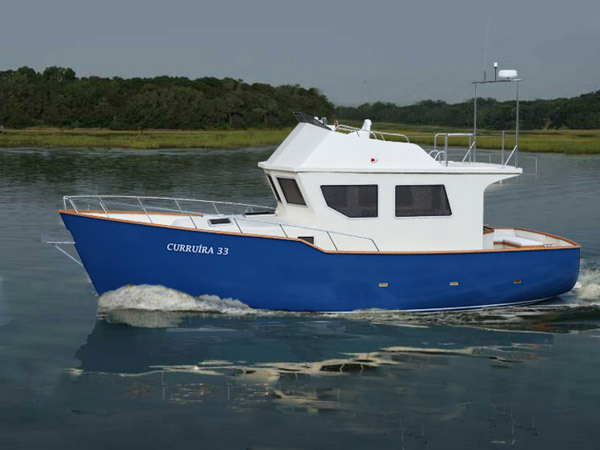 We are proud to announce the introduction of a new trawler in our line of stock plans. We are confident that this yacht will leave many boaters with their mouths watering. Recently I was in Ilha Grande, SE Brazil, waiting for my wife Marli to come back from a trip to visit her family in Rio Grande do Sul state, Southern Brazil, and knowing that she was to come back by ferry to a bay a few miles upwind, I decided to take advantage of a few unusualy windy days in this área to test the boat in this type of conditions, which we did not have during our trip North last year. 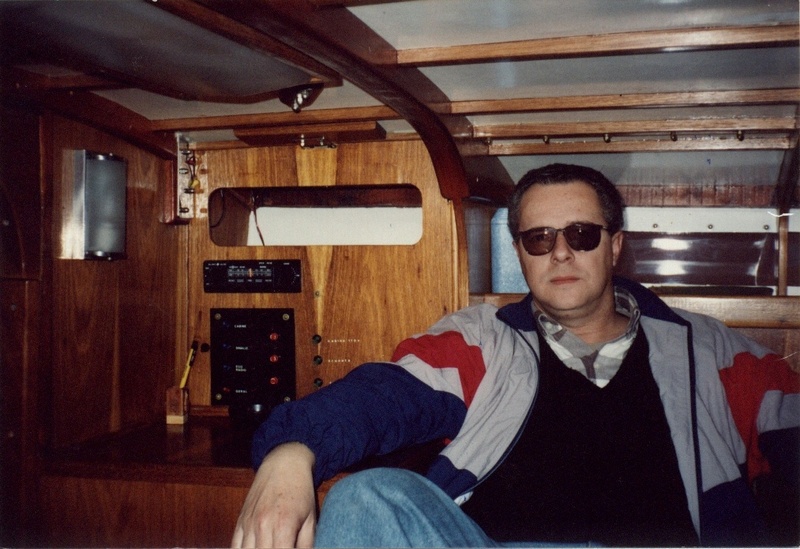 Our intention of designing affordable offshore cruising sailboats within the scope of amateurs to build them keeps showing positive results. Talking about the potential of a promising class called Pop 25 one year ago could be considered at best a case of wishful thinking. However, at the moment this is no more just a speculation. 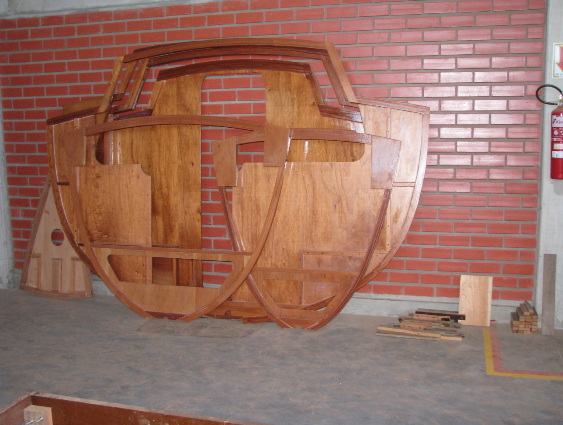 Coinciding with the latest pictures we got from Ilha Sul boatyard from Porto Alegre, Southern Brazil, we also just got news from two other builders, who sent us pictures of the beginning of their own projects, one in the Argentinian city of Córdoba and the other in the city of Tubarão, in Brazil´s Southern state of Santa Catarina. Below there is a video that was put together by me and my wife Marli Werner. 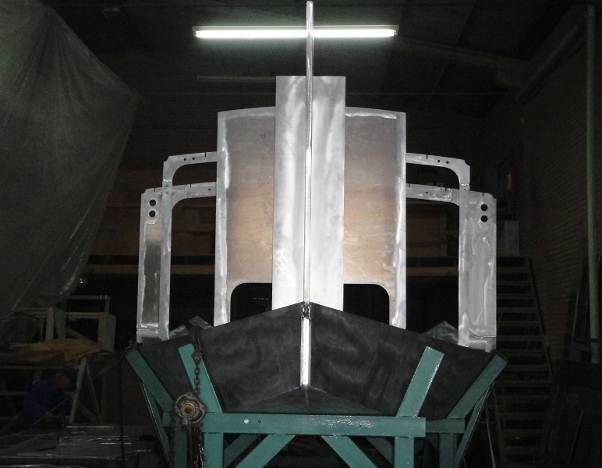 If you are arriving now, we built the prototype of the Kiribati 36 design, our aluminium swing keel yacht Green Nomad. 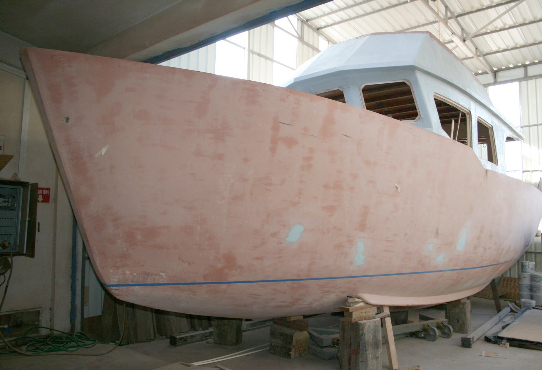 Our community of Pop 25 builders must be happy with the progress in the constructions of boats of the class. Our clients who made blogs to inform about their constructions are showing impressive updates of their work. I have a friend whose friendship I deeply praise. 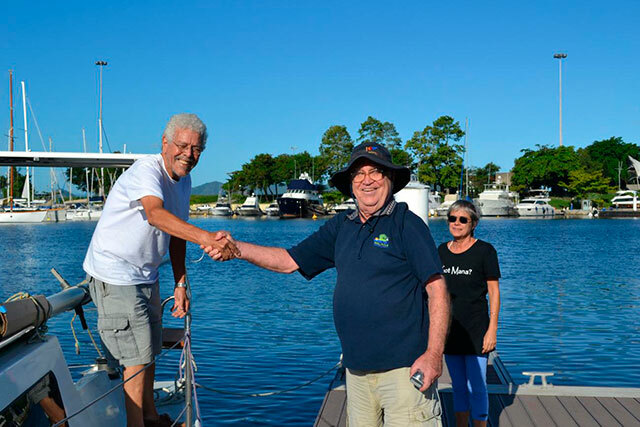 His name is Webb Chiles, and I’m quite sure that there is no need to introduce him for most of you, our cruising fellows, since the feats he already accomplished in the nautical world made of him one of most renowned American cruising sailors. Good news for the Pop 25 class. We received a few days ago a phone call from Daniel D’Angelo, the amateur builder who is probably going to be the first person to conclude the construction of a Pop 25, when he told us that after three months without having fresh reports about his construction (see his blog in our link’s page: Pop 25 Horus), finally things began to happen again, now at a fast pace. 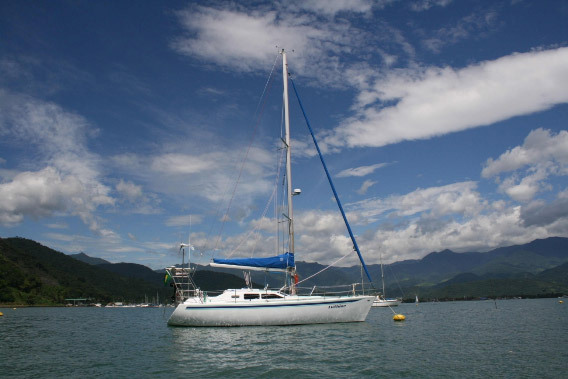 When we developed the MC 31 cruising sailboat stock plan, we could never dream that so many cruising sailors would elect this boat as the yacht of their lives. 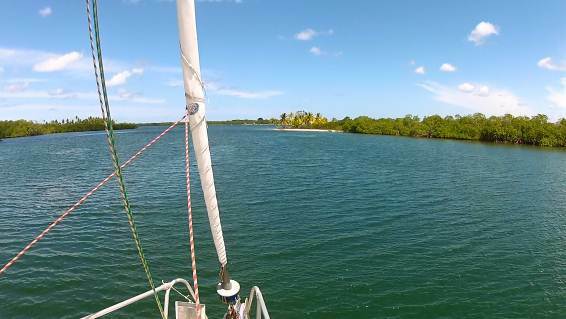 A not so rare encounter of boats built to our plans happened this last month in Parati, south-eastern Brazil, where the Multichine 28 Kyriri Ete, the Samoa 34 Luthier and the Kiribati 36 Green Nomad shared a beautiful anchorage for some days. This note is to congratulate Paulo Ayrosa, the owner of the fantastic Bepaluhê, for his achievement in obtaining the coveted International Captain’s license, a reason for pride that can only be appraised by those who already overcame this same hurdle, the feeling that, after building his dream boat, now the world is within the reach of his finger-tips. It seems it was yesterday that the first MC 28 went sailing! However, lots of water passed under the keel of the class already. 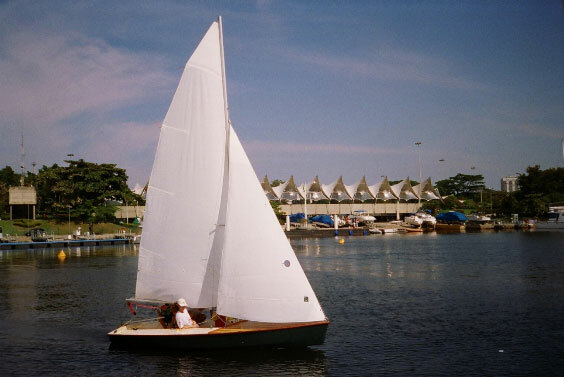 It is making twenty years since Sabadear, the first boat of the class to be completed, had been launched in Cabo Frio, State of Rio de Janeiro, Brazil. 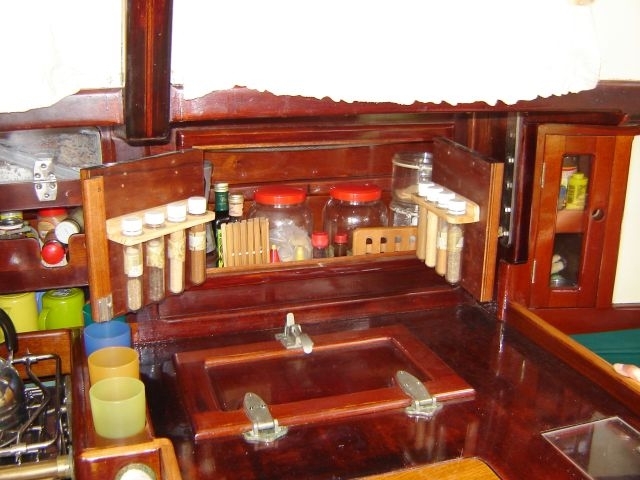 It was in the year of 1989 that in a trip to the Southern Ocean aboard the thirty-foot double-ender Maitairoa, during chilly night watches, that along interminable cockpit chats, the sketchy layout for a new B & G Yacht Design stock plan had been defined. 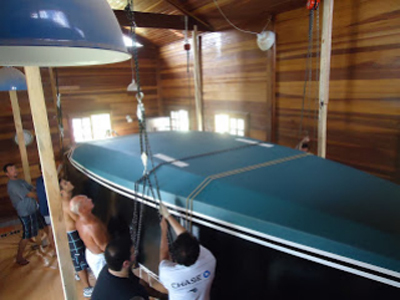 It is amazing the pace of the building of hull number one of our new design Pop Alu 32 at Ilha Sul Boatyard, in Porto Alegre, Brazil. 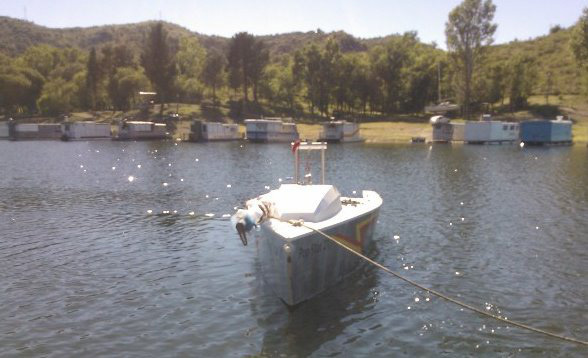 The dinghy Andorinha plans for amateur construction has prepared good surprises for us. 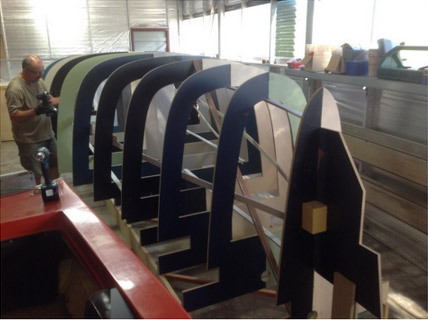 Besides being one of our most successful stock plans, being only surpassed by the MC23 and MC28 classes in number of builders, it is also one of our designs that our clients feel more fulfilled when building one of these boats. Finally a MC 28 crossed the Panamá Canal bound for the South Pacific islands. 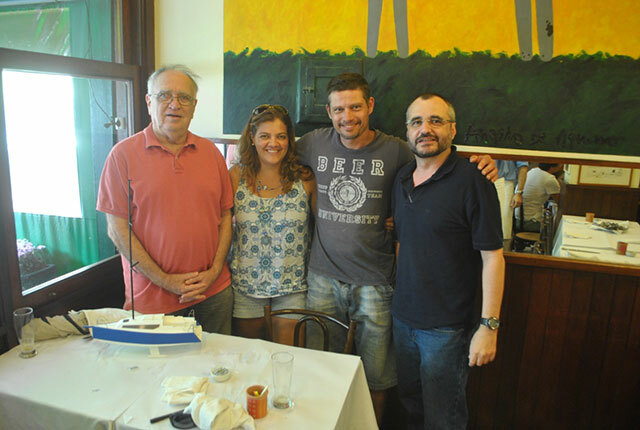 This pioneer is Access, belonging to Flavio Bezerra, the member of the MC 28 club who went farther away from its origins until now. 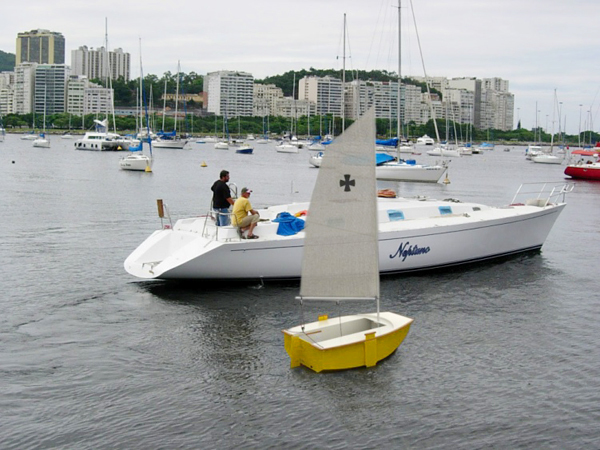 We had observed since a long time that Santa Catarina, a state in South Brazil, is a centre of excellence in amateur yacht building. 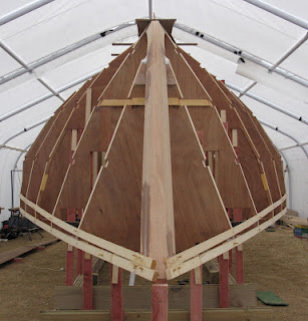 Perhaps for the influence of the large proportion of its inhabitants who are of German origin, with their unequivocal talent for building things, or for any other reason, the fact is that some of our best amateur constructed boats were built there. 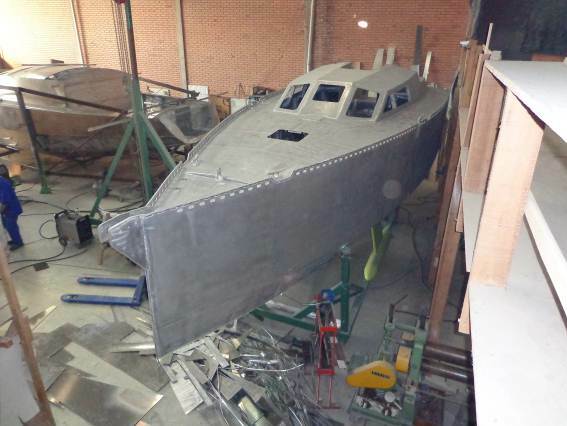 We were extremely pleased when Ilha Sul Construções Náuticas boatyard, from Porto Alegre, Brazil, decided to start building production units of our new aluminium 32 ft sailboat design. The Pop 25 is doing a roaring trade if compared to other designs we introduced in the past. Along the seven first months that the plans are available we already have thirty builders from nine different countries, some of them having edited blogs to promote their constructions. 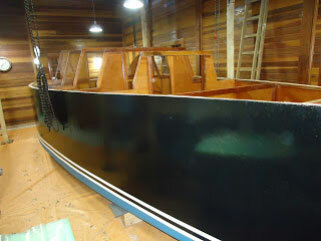 It is very rewarding for us when we see one of our boats being built with a high degree of quality. 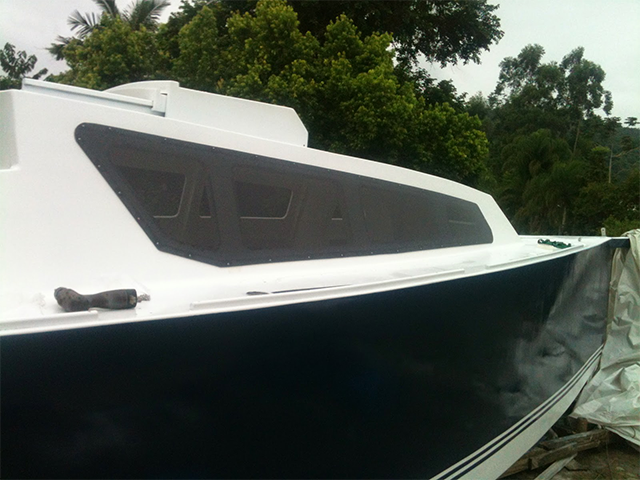 This is the case with the MC34/36 being built by Howard and Noelle Bennet, from Dunedin, South Island, New Zealand. We consider the Samoa 28 to be a special design. Even though it requires an expressive amount of men/hours commitment to be fabricated, its constructive principle is quite easy to be grabbed by the most inexperienced of the amateur builders. On the April, 15, 2012, Raimundo Nascimento, our latest client to accomplish a round the world voyage aboard a B & G designed cruising sailboat, the Explorer 39 Caroll, gave a sensational lecture to the visitors of the Rio Boat Show, telling the adventures of his astonishing fast round the world trip, accomplished in ten months and five days. An image is worth a thousand words, and so as part of the ongoing development of a construction manual for the Pop Alu 32 (initially only for the metal work phase), our new aluminium sailboat design that may be considered a bigger cousin of the already international best seller Pop 25, we have elaborated a slide show that depicts the metal work steps involved. 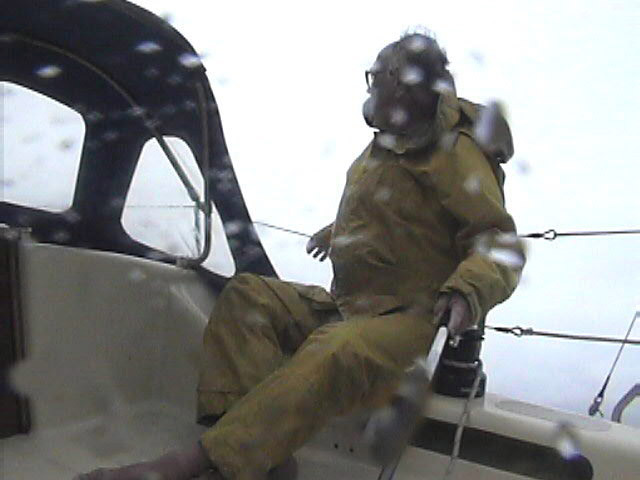 Inside a plastic shed in the cold province of Quebec the sailor and adventurer Eric the Rower is building the open sea kayak Brasileirinho BloodRowing. 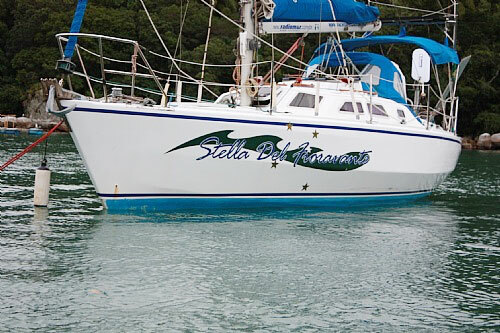 “If you are out and about looking for a comfortable and reliable cruising sailboat for you and your family, the B & G Yacht Design plans should be your first choice”. 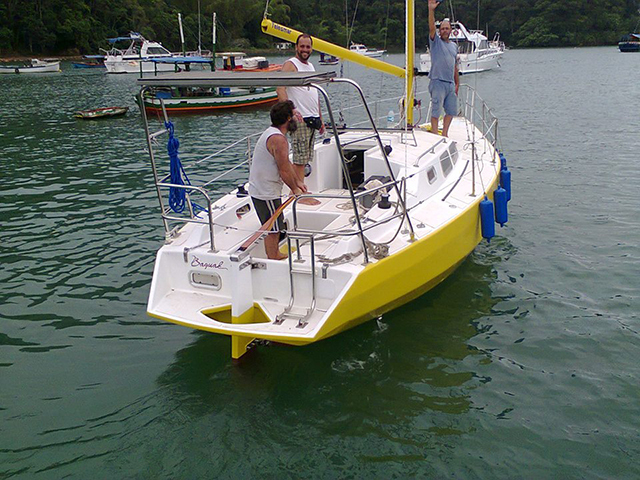 Maitairoa is a custom boat we designed and built to be used by the Barros family in radical sailing adventures. 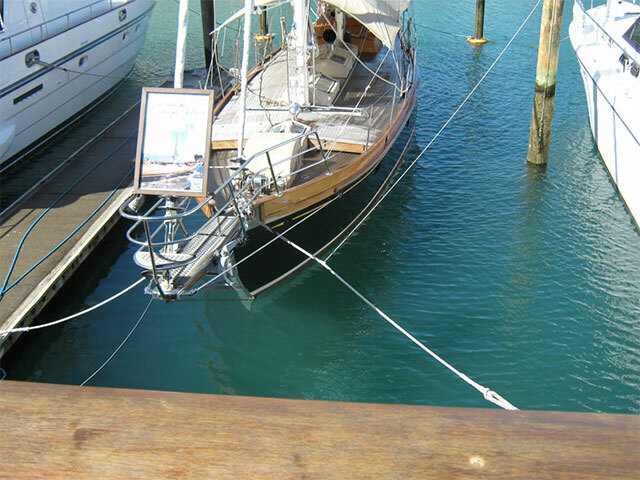 In 2012 Maitairoa is completing the thirtieth anniversary of her launching. 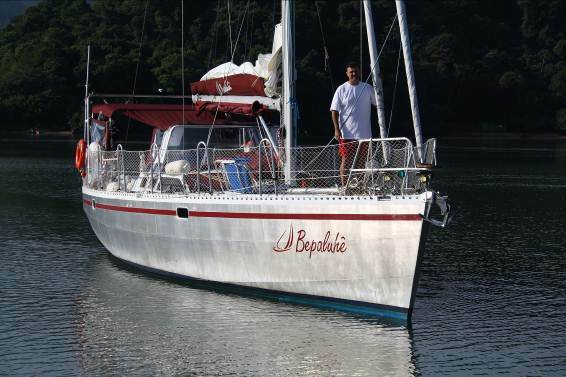 On the twenty-seventh, February, 2012 the Explorer 39 Caroll completed a round the world voyage. Her skipper, Raimundo Nascimento, or sailor Raimundo, as he prefers to be called, is unquestionably a Sailor with capital letter. This design has been upgraded, now being totally modelled in 3D with the option for the builder to buy a set of CNC cutting files that include the whole structure, hull plating, deck, cabin, cockpit, rudder and swing- keel, including keel bearings and pulley bases. 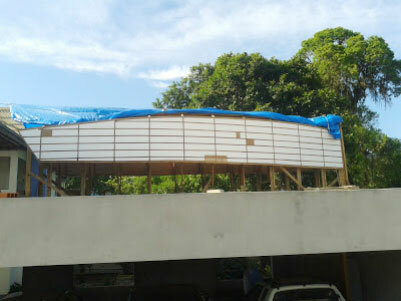 This can make the building very fast and economical. 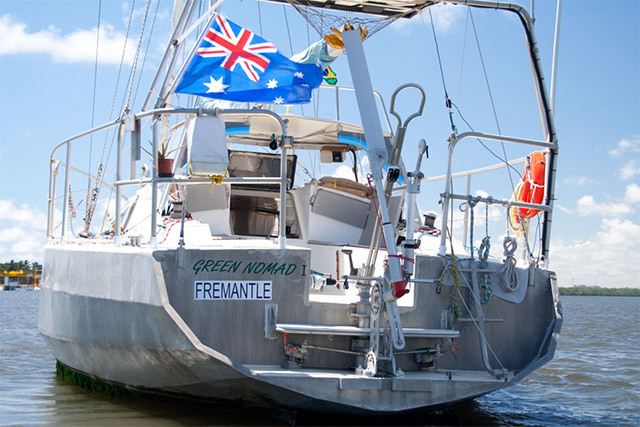 At the end of 2004 we were with our first Green Nomad in Vanuatu, where we had sailed to after spending the previous South Pacific cyclone season in Kiribati and the Marshall Islands. 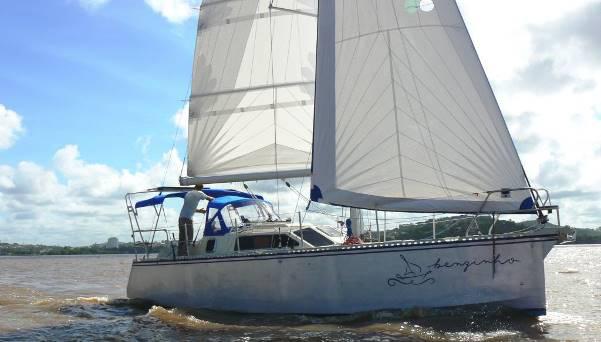 The design Curruira 42 is a case of success among our stock plans. 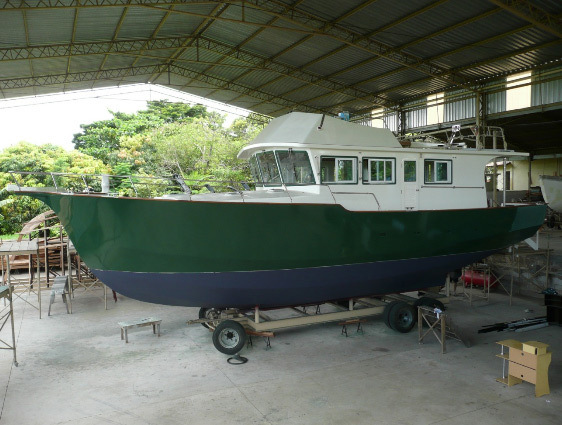 When we decided to design a mid-sized displacement trawler within the reach of the home builder to accomplish its construction, we couldn’t imagine we had hit the nail on the head in touching the heart of so many yachties. It was quite a meticulous work, but we finally have the digital mock-up of the Pop 25 concluded. 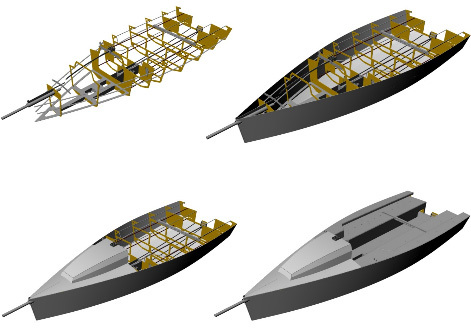 Murilo Almeida, the designer who made the renders, created all the steps of the construction of the boat in 3D, producing the most accurate revision of a plan we ever made. 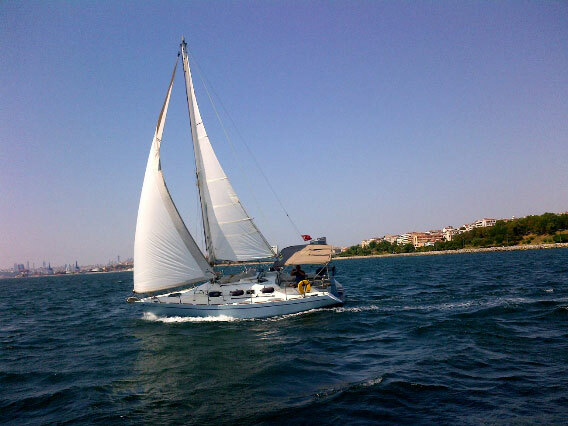 It was published last January in a Turk nautical forum this teasing photo of Geko, a MC26C built by Ömer Kirkal, in Istanbul, Turkey. 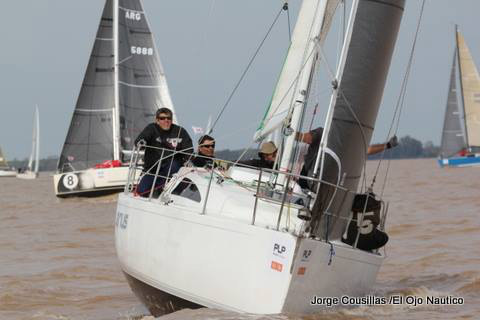 Favourable winds are blowing from Argentina regarding the new design Pop 25. 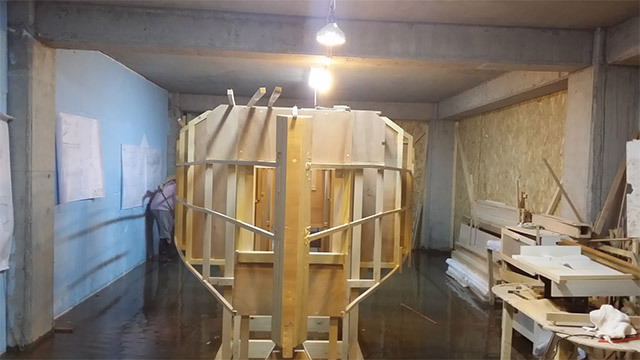 Our friend Daniel D'Angelo, from City Bell, the amateur boat building hub for home construction in that country, is in the last stages of construction of the prototype of the class.